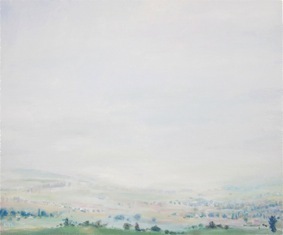 I'm absolutely thrilled that one of my paintings has been chosen as one of 42 finalists for the Glover Prize 2017 which is open to artists worldwide for a painting inspired by the Tasmanian landscape. Being part of the Glover Prize Exhibition is particularly wonderful given that 2017 marks artist John Glover's 250th birthday. The Exhibition of finalists will be launched with a cocktail party on Friday March 10 2017 (ticketed event) when the winner will be announced. It will then be open for viewing on Sat March 11 - Tues March 14, and again Sat March 18 - Sun March 19 2017. 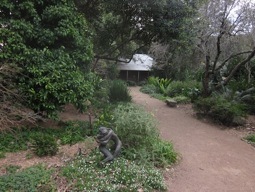 The Glover Prize Exhibition is hung in the Falls Park Pavilion at Evandale, Tasmania, a charming old building with a wonderful statue of John Glover on site. 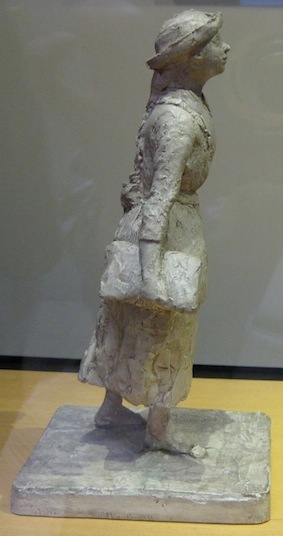 I am very fond of the statue by Peter Corlett, which portrays the artist with delightful folds in the material of his clothing as he is caught in a very natural and ungainly posture, in mid flight as a painter. My own painting is all packed up and will shortly wend its way to Evandale; I'm looking forward to seeing it hanging in context with the complete range of finalists selected by the three judges. Can't wait! Two months in Canada recently were really wonderful, and I'm curious to see what turns up on the canvas next as a result. 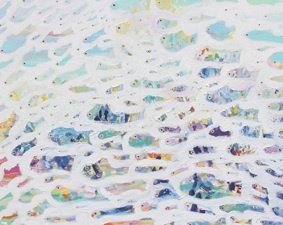 I came home to some lovely news, "Hey drop me a line" has been selected as a finalist in the 2014 Korean-Australian Arts Foundation Art Prize. The entries last year were of a very high standard so I'm anticipating an engaging exhibition. 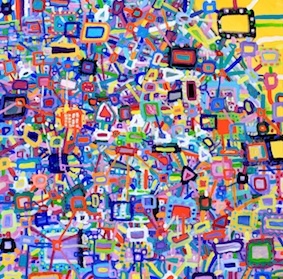 Paintings will hang at the Korean Cultural Office, Ground floor, 255 Elizabeth St Sydney Australia from 26 November 2014 - 30 January 2015. 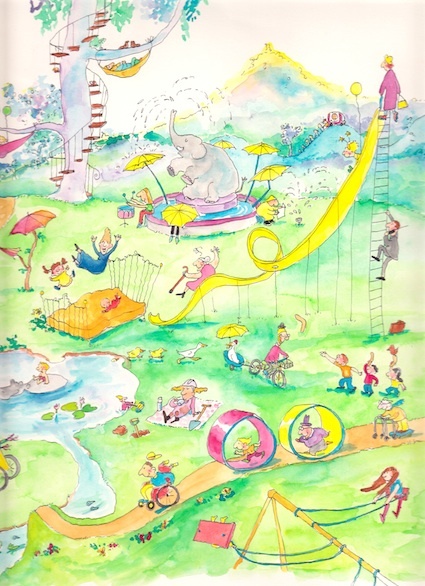 With my "Kerry Millard" illustrator hat on I'm tickled to tell you that "Daisy's secret" by Jodie Wells-Slowgrove and published by Penguin (Australia) for which I made the illustrations is one of 30 books to be selected for an Exhibition of Australian Children's Book Illustration, "Hello! from Australia", at the Bologna Book Fair 2015. The Exhibition is thanks to Books Illustrated and the Australian Publishers Association, supported by Copyright Agency's cultural fund. 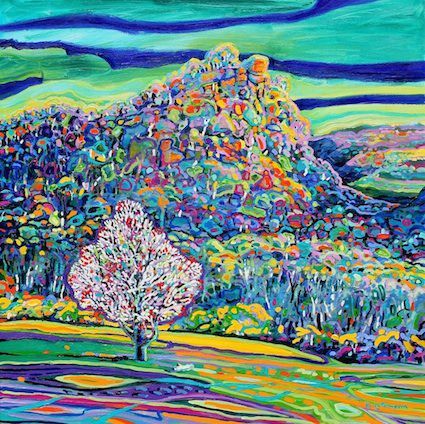 A number of weeks ago I had a lovely adventure as I dropped off two paintings at The Art Gallery of NewSouth Wales, one entered for the Wynne prize, and the other entered for the Sulman Prize, two competitions which are run alongside the Archibald Prize for portraiture. 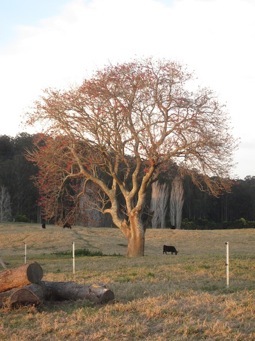 For the Wynne (Australian landscape or figurative sculpture) I entered Flame tree at "Bundanon" which was begun on an artist residency offered by the "Bundanon" Trust on the Boyd property inland from Nowra NSW. 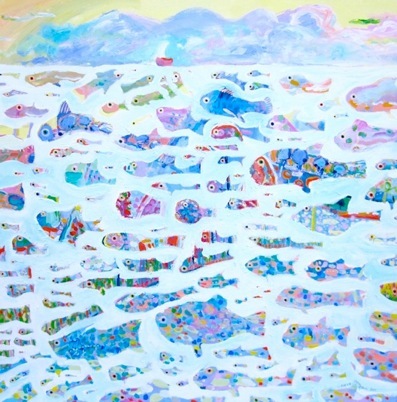 In the Sulman category I entered "Hey, drop me a line" created as a message in a bottle to sit on my website home page in case my absent brother were to visit. I love that paintings which are entered have to be delivered to the Gallery so the judges can actually view them rather than virtually experiencing them via photographic images, which is the case for many competitions. You then get to carry your work through an open behind-the-scenes grey concrete area to the lively smaller packing room where you are asked to lean your painting against the wall and facing it. Your paperwork is checked, each painting is given a number which is written on its back (inked forever!) and then it is loaded onto a special paintings trolley where it gets to rub shoulders with who knows who and is whisked away to await its turn to be glanced at. This year I commented that my paintings were very excited and one of the lovely packing room chaps said, "Of course they are!" Many faces of arriving artists are grim you notice - annoyed to eyeball their competition? Worried at leaving their babies? Wanting to appear professional and slightly disapproving of having to go through this process? Wondering how they got the thing in the car in the first place because it certainly doesn't seem to want to come out? Who knows? If by any chance your work isn't selected to hang it's not all bad because you then get to go back again to collect it, only this time the boom gate is down so you get to press the button and tell security with a casual air that you are so-and-so collecting your works from the such-and-such prize, the gate lifts and you pass into the much quieter parking area given that there are more days available to pick up than there were to deliver. You are again amused at the idea of a loading dock for art, hand your paperwork back which is passed to a lanky fellow whom you trot after as he loops and swoops out one door, across part of the actual gallery with artworks on the walls and public milling about little guessing the back room goings on in their midsts, through a well concealed door into a large room where there are paintings leaning against paintings leaning against paintings. Oh wouldn't it be wonderful to be able to take a peek at them all??? Your own canvases are located by number and you carry them back across the public corridor, back through the inconspicuous door you hadn't realised you'd emerged from and certainly wouldn't have been able to find if the lanky chap weren't navigating, out through the loading dock and back to the car. 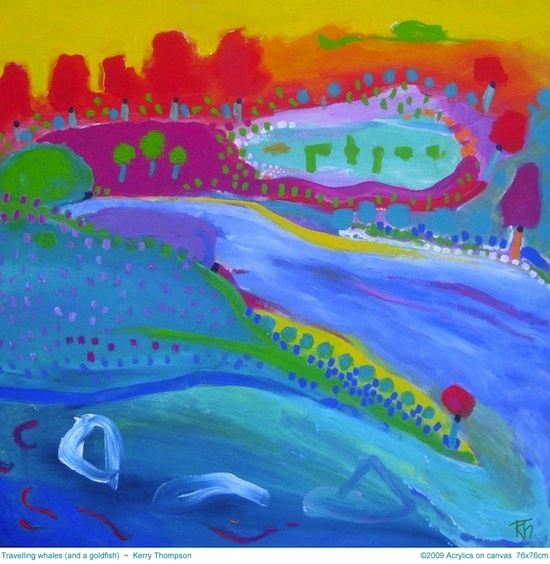 As you wait for the boom gate to lift you savour the last few moments this year as an artist whose work has been viewed at the Art Gallery of New South Wales. Last week the most lovely package arrived - my advance copy of the fourth Wilderness Fairies book, Daisy's Secret! It's always a big thrill to see the first copy!! 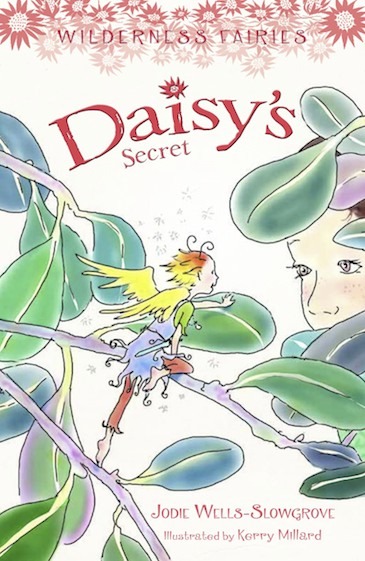 Daisy's Secret, published by Penguin (Australia) will be let out of the bag on August 23rd. There were some very challenging and delightful animals for me to draw in this book (have you ever looked closely at the pattern of scales on a diamond python? I mean, REALLY closely? ), and we meet some great new characters created by Jodie Wells-Slowgrove. Keep an eye out for Raven! The gorgeous and subtle dusting of glitter on the cover is a really nice treat so thank you Penguin for adding that sprinkle of sparkle to these books. 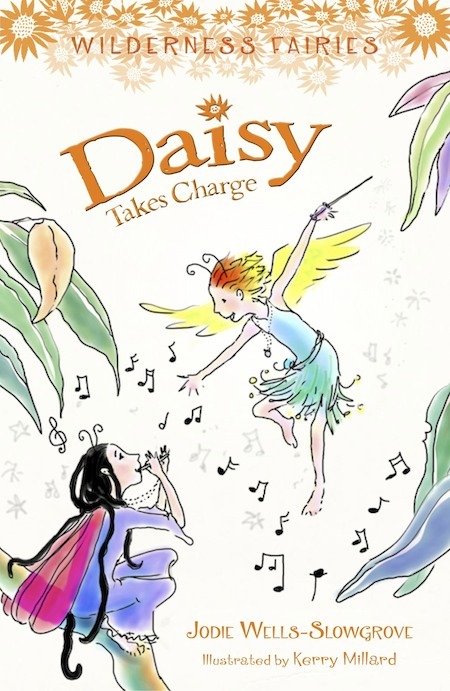 Daisy Takes Charge is born! 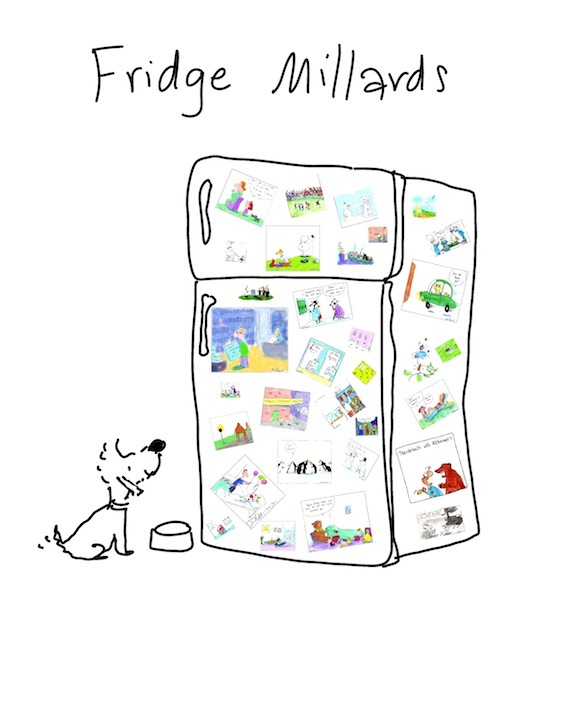 On July 23rd Daisy Takes Charge by Jodie Wells-Slowgrove, which I illustrated with my Kerry Millard hat on, was released - it's a great story, and when I have some good copies of the internal drawings I'll show you some. 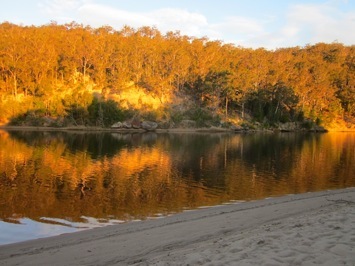 Because these stories are set in the Australian bush with real Australian wildlife and plants, I have enjoyed doing a lot of research to get everything right. Whenever I illustrate a book there seems to be one illustration each time that I'm looking forward to painting. The illustrations in these books are painted in grey, like black and white photos, and I love how important light and shadow become. 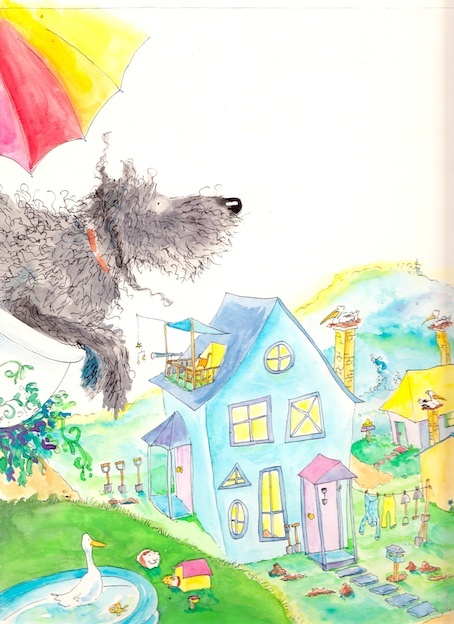 There were actually two illustrations I was really looking forward to painting in Daisy Takes Charge and I will put them up here when I can ... my scanner fell on its head and is a bit woozy so I'll see if I can get some excellent scans from Penguin. The fourth book in the series, Daisy's Secret, will be released in September. There were some doozies of illustrations including a diamond python whose markings were a real challenge and delight to create; it all went to the printer a week ago so everybody is busting to see it put together as an actual book! Oh, and there's a subtle layer of delightful very fine glitter on the covers - more on Daisy Takes Charge and Daisy's Secret than on the first two books - we all loved the touch on Daisy's Quest and Daisy's New Wings so much that we indulged ourselves with the second two! It's just a fine sheen, like frost, and is very satisfying. Last weekend I went for a walk and passed a driveway with a sign saying art, antiques, etc were for sale so I thought I'd have a look. Saturday is a good day for Garage Sales! Teacups, model trains, pedal organ, ... I said hello to the chap and we chatted. I was carrying a piece of paperbark which I'd picked up because I've just made an illustration of a character dressed in that very material, he commented on it, and the subjects of art and illustrations then came up. He told me that he and his wife have a gallery and in fact have had several galleries, and that he is an illustrator too. When I asked about their gallery he said they have one in the city and organise artwork to be hung at a major hotel in Sydney. I said that I'd probably be coming to see them one day because I paint and have planned to chat to several hotels about my work. 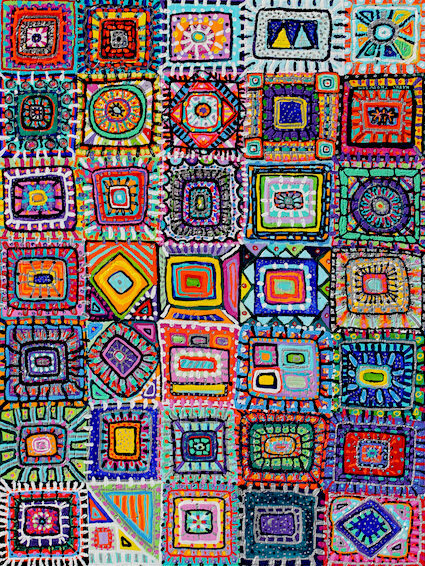 After yarning with his wife who was lovely to chat with, we exchanged details; I offered her a post card with mine on them (I always carry a batch with me for when folk ask me what kind of painting I do) and when I suggested she could keep as many as she liked, she asked if she could take them all to try them out. Sure, I said, never having had anybody take the lot before, but happy for them to see how people in their gallery respond to my work. We arranged that she would ring me in a day or two to book in a time for them to come over to my place to look at my paintings in the flesh. Exciting! So the next day I Googled them to see what their gallery looks like and to find out exactly where it is. Up popped headline after headline about artists who had been ripped off by them, a NSW Supreme Court case where a chap owed $71,000 sued them and they were closed down - they have had several galleries close leaving artists in the lurch for over $118,000.00 at one stage - then have re-opened elsewhere - several papers ran articles about a large number of artists who had never been given their portion of sales or had never been given back the artworks themselves and whose phone calls, letters, emails, and even court orders where ignored!!!! I am glad to move through life trusting and enjoying people, but am also grateful we have the facility to discover unwise business partners thanks to the efforts of those who have suffered at their hands and have tried to do something about it, journalists who report on them, and Google where the information is available. I love The Art Gallery of New South Wales. All of the words in its name are friendly, and I think it reminds me of the excitement and pleasure of visiting the Art Gallery in Ottawa as a child with my grandmother, then having lunch in the cafeteria on the top level. 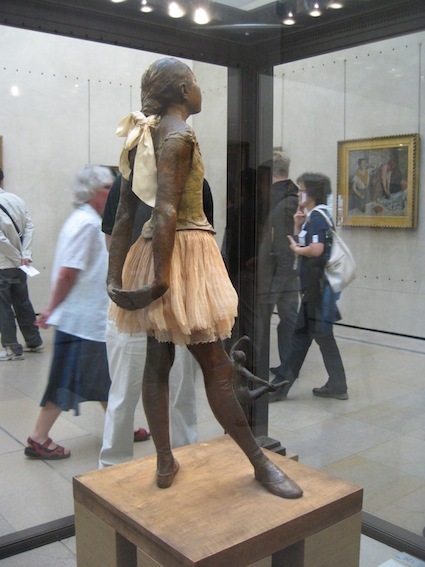 I still remember being entranced by an exquisite little bronze figure of a woman standing with her head bent over, combing her curtain of hair. 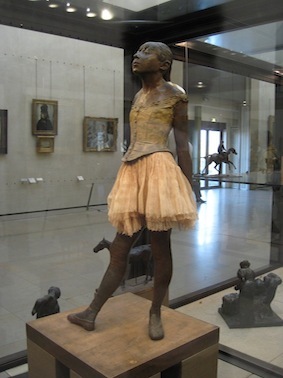 Years later I was in France and entranced by Degas' little dancer (I fell in love with her) and a small figure of a schoolgirl. This schoolgirl is tiny, but utterly captivating. 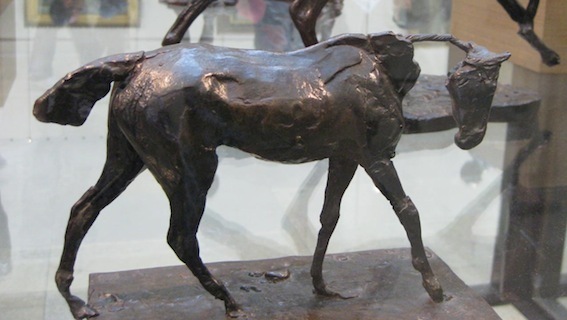 Degas was a magician with body language - Here is a horse - we don’t even miss the neck which is undeniably there, even though it isn’t. And the legs, though roughly formed, look exactly right to be weight-bearing or partially weight-bearing. There's always something deeply satisfying when an artist working in any medium knows and then captures a subject from the inside out. As the wood stove takes the chill off in the evenings and the days are glorious here in Sydney, I thought you might enjoy a mini exhibition of a few new paintings. This painting ended up being about a blanket and a hug. When I took it to be professionally packed to go to its new home, my chap had left a note sticky-taped to the door saying "Closed - we are visiting our first grandson!" They say that no two snowflakes are the same, but how do they know? How DO they know? And who are "they"? Snowflakes are usually symmetrical so you'll notice I've included a little personal visual chuckle with a few rebels. This piece was created for and about a musician. While working I listened to her favourite music including Bach's Brandenburg Concerto #5, the handwritten score of which was sitting online (!). 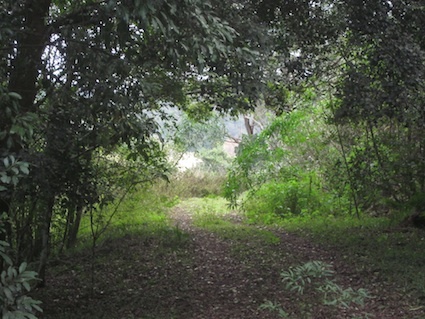 It was exciting to use a bar or two as a topographical map for the landscape. Among the trees are clarinets, music stands, trombone slides, brass instruments, flutes and piccolos and fiddles sprouting from the ground, staves flow across the landscape and musical notation fashioned after Bach's handwriting is sprinkled through the undergrowth and canopy. The musician is going to try to find the exact spot on her recording that I used as my map - so she'll be listening to her painting. Layers upon layers - fantastic! 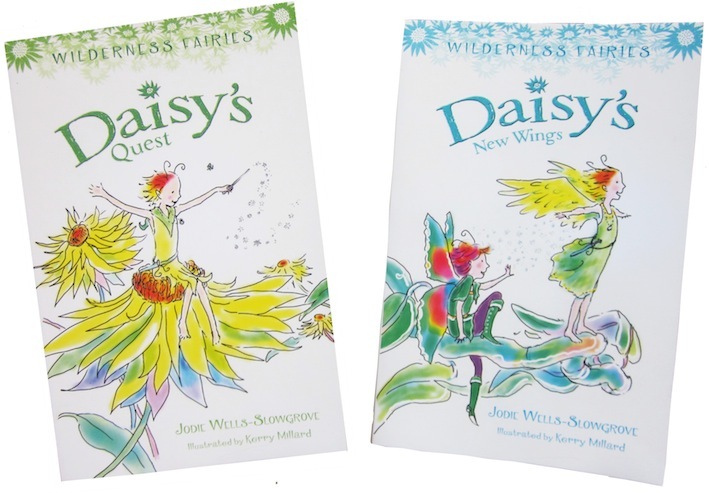 Daisy's Quest and Daisy's New Wings have arrived! With my hat on as Kerry Millard, illustrator, I am very excited to be able to finally reveal the covers of my latest two books! Wilderness Fairies set in the Australian bush, with a delightful young fairy called Daisy and her family, friends, and adventures. Daisy's Quest and Daisy's New Wings are books one and two in the series and it was so exciting to finally see them as actual books and not just illustrations and pages of words scattered all over my living room! Jodie has written great characters and relationships and stories and I enjoy the language she uses. 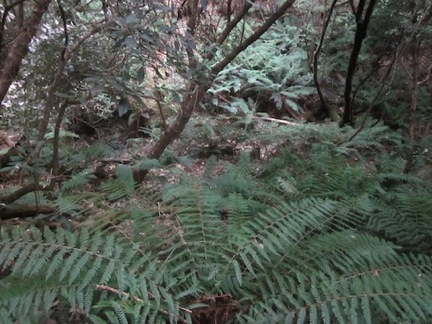 Set in the Australian bush, we meet a variety of familiar and less well known bush plants and animals. 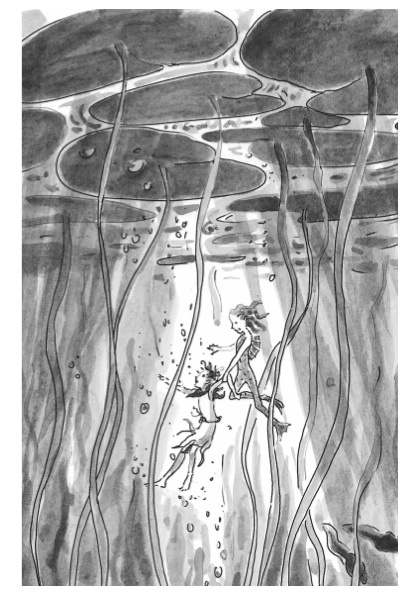 The drawings on the inside have been painted with a grey wash which was handy as a lot of Daisy’s Quest takes place at night or underwater! I’m about to begin working on the next book in the series with a meeting with our editor tomorrow to talk about what illustrations I have in mind. There are quite a few new characters in book 3 whom I am looking forward to meeting as they appear on the page. The first two covers have a subtle splash of sparkle on them here and there which gives them a really gorgeous texture and makes them very tactile. I’ve never done books with sparkle on them before and now that I’ve seen how excellent it is it will be very hard to hold back from going a bit nuts on books 3 and 4! 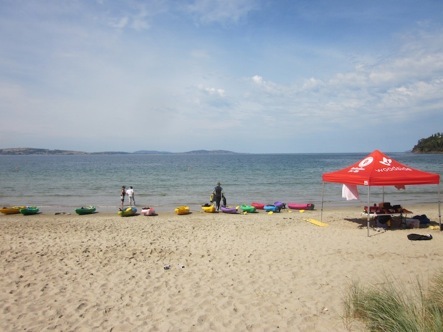 Do take a look at them if you see them in your travels! I’ll add one of the illustrations here, from Daisy’s Quest. 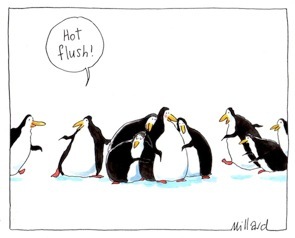 Under my illustrator/author/cartoonist nom de plume, Kerry Millard, I have been commissioned to illustrate a series of books by publishers Penguin (Australia). On Thursday a few days ago I delivered the finished artwork for the first two books in the series of four! Very exciting - I had just finished applying a grey wash to the line drawings. It is always a great moment when the work can be spread out on a big table and revealed to the editors and publisher. Luckily they loved them, and having arrived at Penguin at 3pm, by 4pm the illustrations had sneaked into the overnight courier bag to Melbourne (it was already closed but was opened up to let them in) where the designer is having them scanned, and is placing them with the text. The two books go off to the printer before Christmas. Even though I had set up a room in my house to do the work in, as per usual I ended up doing it on my dining room table and eating wherever else I could fit. 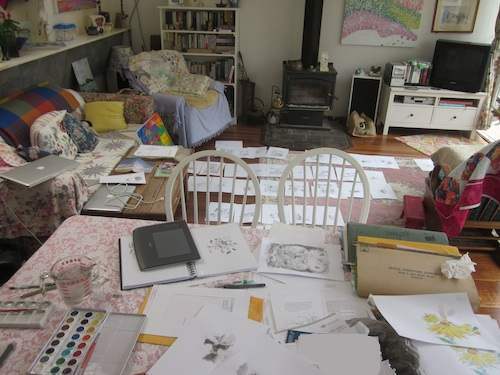 Here is a photo of what my living/dining room looked like part way through book 1. Some of the pictures are of things happening underwater, and some are at night, so it was challenging to work out how to paint them with my little paintbrush without the paper getting so wet it buckled. As soon as I’m allowed to tell you the titles and what the books are about I will, but at the moment it is still top secret! 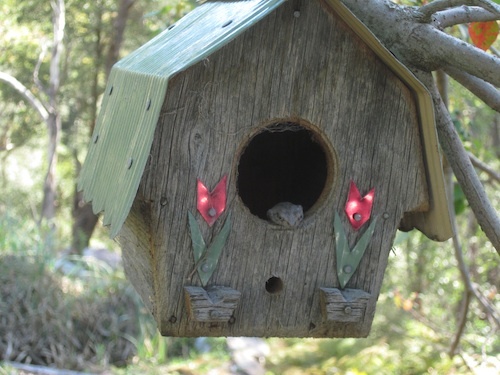 Oh, and here's a little visitor I spotted in a birdhouse I bought at Salamance Markets in Hobart two Christmases ago! It’s a charming wee frog! The Critic: With my Sunday morning cup of tea I’ve just read John McDonald’s review of the Red Queen exhibition at MONA in Hobart, Tasmania. The Red Queen: The underlying impetus for the MONA (Museum of Old and New Art) exhibition is the biological proposition put forward by biologist Leigh Van Valen in 1973 that constant change (evolution) is necessary for the very survival of a species - that due to the ongoing assault by predators or parasites, species don’t just reach a point of perfection where they can rest on their laurels (this is in a nutshell in a nutshell). The Red Queen in Lewis Carroll’s “Through The Looking Glass” at one point remarks that it takes all the running you can do to stay in the same place. I would add my current theory which is that creativity is a restlessness. Restlessness to unpick and reassemble ideas in new combinations is advantageous to survival because it leads to the discovery of more successful ways to deal with the world as it is and of responding to new circumstances which may arise. This isn’t to say that “it’s all good” because we are primitive animals at heart and ideas can still be used to enhance our brutality. However, I think that creativity in art is part of our societal sandpit to make a mess, see things differently, astonish ourselves with new discoveries. The Tweak: So … what about those artists who work in the same way over and over? Where do they fit in with my theory? Are they not creative? Only the artist her/himself will know what evolution may be occurring internally, but it makes me think that perhaps besides the explorers and inventors and thrill-seekers who can only tolerate a new challenge, for survival as a group we also need those who crave to perfect a craft or skill, to sit with an idea and get to know it intimately and share with the rest of us its nuance and potential. I suspect we all harbour elements of both the desire for new challenge and the desire to repeat what is familiar and comfortable but we either work primarily in the way which is inherently stronger in us, or could it be, in the way which has become stronger because it is encouraged by our particular surroundings, which may mean the role that best suits our group as a whole in the long run? Time for a fresh pot of tea. 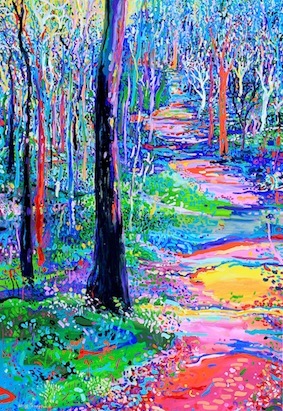 R ecently a lovely couple asked me to make for them a large painting of a track through some gorgeous bush which they love, particularly where it crosses Blackbutt Creek. 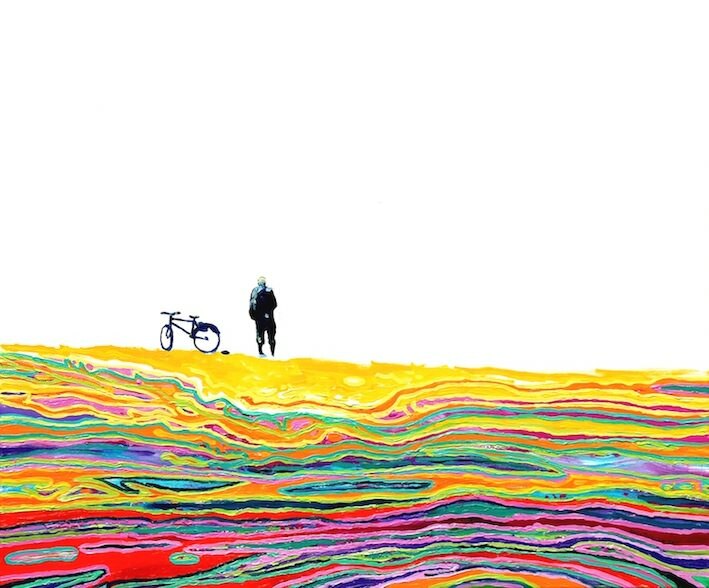 Commissioned work is exciting because I make a painting about the people who commission it. We got to know each other a bit, went for a walk together to share their experience of the place, and then I visited the bush again after rain. Gorgeous. 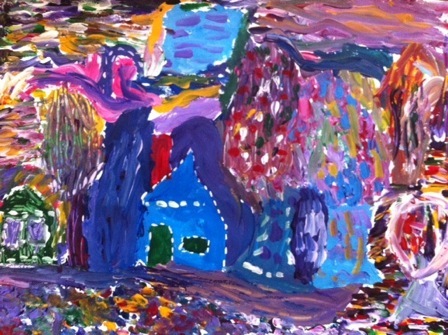 Then onto a huge canvas "By Blackbutt Creek" emerged. T onight it went to its new home. 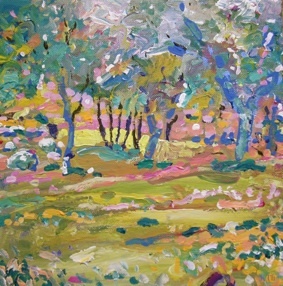 The painting changes with different lighting, creating different moods and looking like different times of day. It looked very happy in its new setting and I will visit it again some day when it is in its final position. 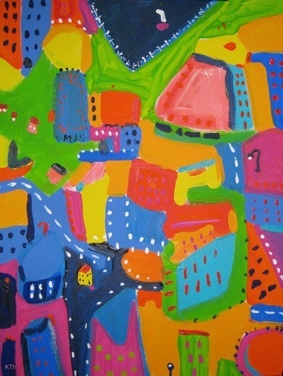 My exhibition “City ditty” is happily hanging at Gallery Mercure (226 Victoria Street Potts Point NSW 2011 Australia) and on April 14th there will be a drinks talk and tour from 4:30 - 5:15 pm, drinks from 4:00. 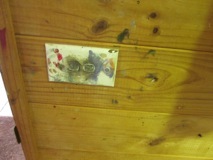 We’ll have various smaller items available for sale with various paintings printed onto them (e.g. cards, tiles, postcards)… and I’ll be sharing what possessed the goldfish. In another part of town, at the National Art School*, Ben Quilty’s exhibition After Afghanistan is hanging until 13 April then will begin a 2 year tour of the country. I saw the first of two ABC Australian Story documentaries with Ben talking about his experiences as war artist, and watched him working on these canvases via my TV screen, but was unprepared for the genius and power of these works. They are big, and they are visceral in the application of paint, the silences of blank canvas, the bold and tender disconnected swipes of pigment which create an intensely moving and powerful response in the viewer, you just have to glance at the faces of those in the gallery, and at the same time are intensely exciting as works of art. We are seeing Ben’s soul in the passions of paint, as much as we are seeing the souls of his subjects which he and they have shared with complete candour. 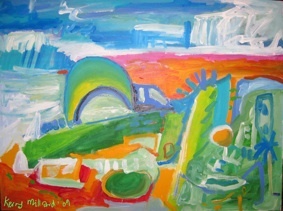 We are not seeing paintings OF subjects - we experience a melding with them. There are no images to accompany this post because this collection of works needs to be experienced, in person. On Saturday March 23rd we had a lovely opening for my current exhibition, City ditty, hanging at Gallery Mercure, (Level 2, Mercure Sydney Potts Point, 226 Victoria Street Potts Point NSW2011 Australia). What a lovely group of people came along, thanks so much, and I loved that everyone was meeting and chatting with each other. I have been working with photographer Geoff Jaeger on this project, and have thoroughly enjoyed collaborating. Great when two minds think alike! 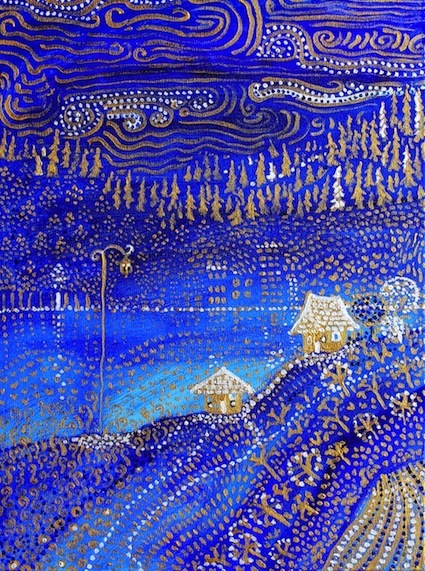 One very different painting is Blue city made with gold and silver paint (which looks white in the photo) on a blue background. Luckily we found the perfect spot for it to hang where the metallic paint catches the light from a window and almost glitters. 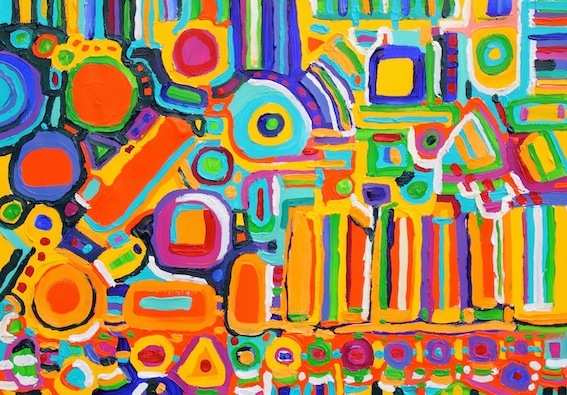 Tonight is the cocktail party opening of the Lindfield Art Festival, then next weekend my exhibition, City ditty, will open on Saturday afternoon at The Mercure Sydney Potts Point. Lots to get dressed up for! Not to mention our choir singing in (the foyer of) the Sydney Opera House on Tuesday March 19th! Glad rags everywhere! I’ll pop the newsletter here so you can find all of the information. I’m looking forward to Gemma’s talk at 4:30 Sunday afternoon…look at the end of the newsletter to see what she’s done. I hope that all is going well in your neck of the woods! from 23 March to 24 April 2013. Friday 15 March - Sunday 17 March 2013. You'll spot three of my paintings in the show along with a wonderful collection of works by a wonderful collection of artists. I know, because I saw what was being hung when I dropped mine off! Holy Family Catholic Primary School Hall, 2 - 4 Highfields Rd, Lindfield NSW 2070 Australia. 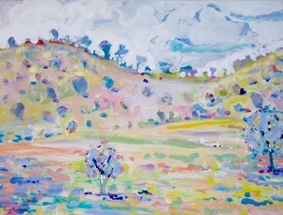 "Balingup" hills will be auctioned at the Friday night cocktail party, proceeds going to St Judes' College in Tanzania. "Holy Family has proudly supported St Jude’s College in Tanzania for several years, sponsoring a teacher and two students. St Jude’s school provides a chance for the brightest and poorest children to escape the trap of inadequate education, illiteracy and poverty. Gemma Sisia, a girl from country NSW, established the school in 2002, which has grown from three students to more than 1500." I think Gemma will be giving a talk at the show on Sunday. I'll be finding out on Friday evening what time so let me know if you'd like to know too! Thank you for letting me share paintings and adventures with you. On Saturday February 16th I finally got to the Francis Bacon (post 2nd world war British Artist) exhibition at the Art Gallery of New South Wales. 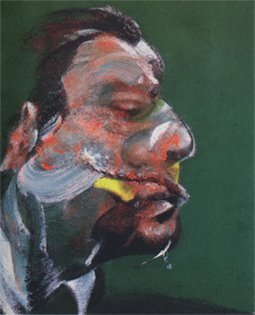 Francis Bacon's work is described as confronting, eliciting a visceral reaction, representing isolation and man's brutality to man. It wasn't an exhibition I was sure I was curious enough to see. Then I caught a documentary where he was being interviewed and was struck by his almost naive and vulnerable demeanour, sometimes like a rabbit caught in the headlights, his fascination with images, his hanging out at the pub talking, and his comment about being an optimist about nothing. Which is not the same as not being an optimist about anything. 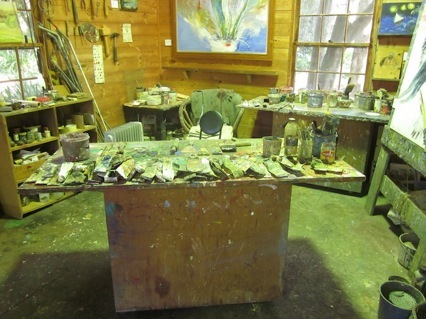 His studio was a pile of chaos. He appeared haunted, but behaved much like a precocious child trying to look grown up. It was interesting to see how the relative status of Bacon and the interviewer reversed as the interview progressed; I wondered if the interviewer was unconsciously responding to the child. 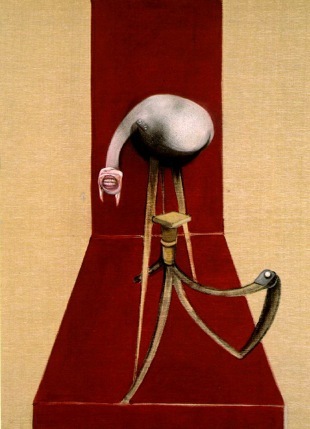 I wonder if Bacon's images are confronting because we are viewing a differently-organised collection of recognisable fragments of the human body, and carcasses, for example, which we would normally only see as injury, accident, dismembering. 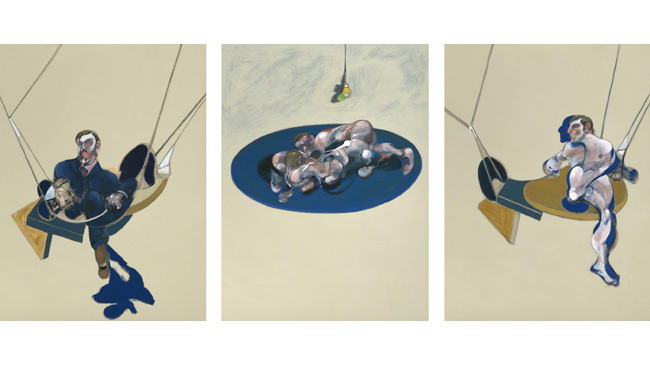 It surprised me that rather than shocking, the paintings were exciting and set me to thinking. The curation of this exhibition was brilliant - particularly the vivid colour scheme of the walls. Bacon's works are quite different in life than reproduced as small photographs. I wasn't expecting to find them so stunning. 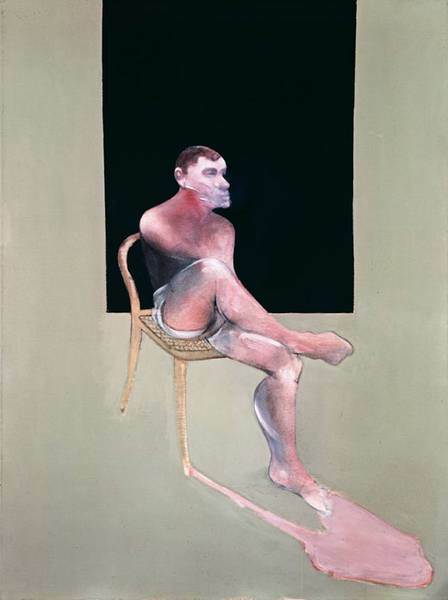 Francis Bacon’s optimism is evident, I think, in the beautiful colours he used even in the most confronting works, when you get up close and look at the detail. His assembly of just-on-the-edge-of-comprehensible fragments to make up a face or human form made me think immediately of the experience of people who have been blind from birth, then through medical intervention suddenly gain sight. They are not at first able to see distinct forms because their brain hasn’t yet learned how to take in all of the visual information and organise it into a chair, a floor, a face etc.. I love how Bacon’s conglomerations convey perfectly the sense of the person or interaction between figures using fragments that we recognise at almost a primitive level. 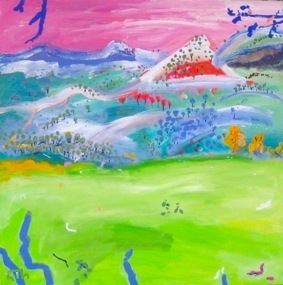 I wondered if the chaos of Bacon’s studio helped him feel less restrained with his painting practice (throwing paint at a canvas, for example) when he wanted to be. 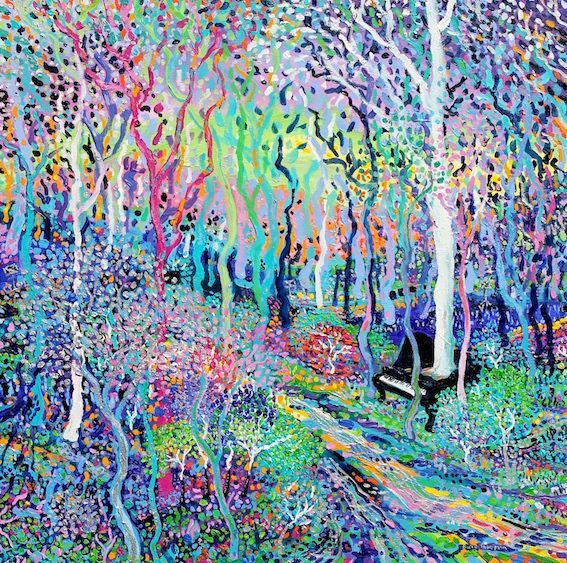 It mirrors the chaos and unexpected juxtapositions of imagery in his works. I wonder if it stimulated and inspired some of his assemblages. 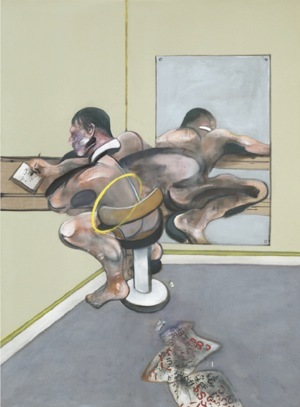 Bacon’s tryptich of John Dyer after his suicide was powerful because the flesh is so alive, the figure sitting as if alive, but the closed and sunken eyes reflect the fact that Dyer is dead. It takes me immediately to a sudden death in the family when I was a child - I remember feeling the almost surreal sense that I was still in the same day when the person had been alive, but completely and irreversibly separated. To me Bacon has captured the desperation of grief, of willing life back into the almost as good as still alive body. There are lots of things on the boil - if you visit the newsletter page you'll see a few! I recently visited the closing days of an exhibition of The White Rabbit Gallery's private collection of works by contemporary Chinese artists, here in Sydney. The exhibition, Double Take, was all about things that aren't what they appear to be. 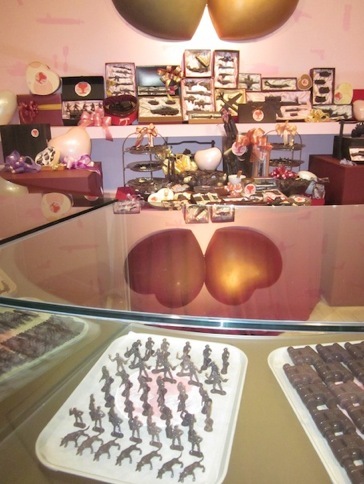 A chocolate shop! Yum, even the smell of chocolate wafting through the room and Valentine's Day hearts. Then you realise that the chocolates are made in the shape of military machinery - tanks, guns, soldiers - complete antithesis to chocolate and chocolate shops and all of their associations, and the gulf between them packs a punch. 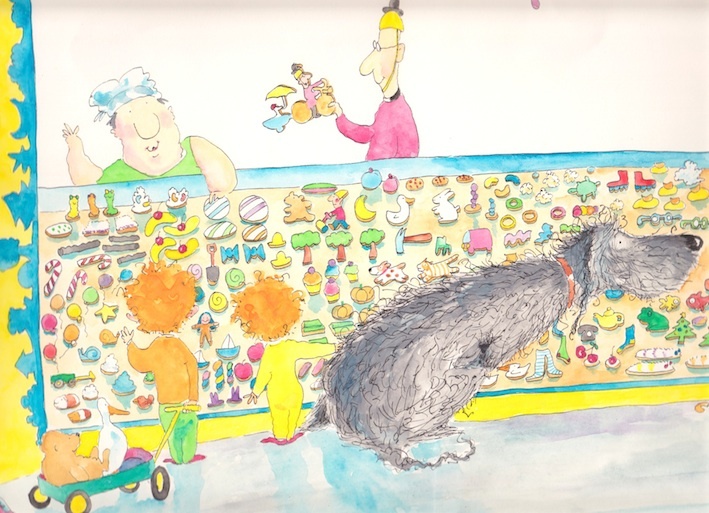 Then you discover that the objects are actually made of plastic and the chocolate scent which comes from behind the counter is deliberately driving you to a wrong assumption about what you are seeing. But plastic soldiers are toys. We are familiar with them and give them happily to our kids, oblivious to and not even connecting them with what a soldier actually is and does and suffers and represents. But let us believe that they are made out of chocolate and the contrast opens our eyes. This is reminiscent of one of the most disturbing pieces I’ve experienced, Remains of a suicide bomber by Diane Worland, Melbourne, Australia at MONA in Hobart, Tasmania, Australia. Created from chocolate. The impact of such juxtapositions is powerful. 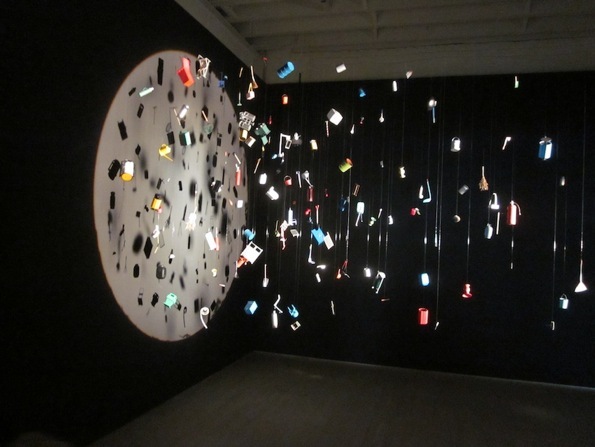 A true delight was the dust caught in a spotlight's beam - which turns out to be myriad tiny objects from daily life all recreated in miniature by the artist, Cong Lingqi, and suspended from the ceiling ingeniously in such a way that their shadows on the wall almost never overlap. The further the object is from the wall, the more its shadow is out of focus giving the shadows a three dimensional flavour. 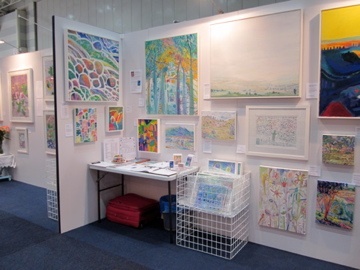 This exhibition has finished, but I am looking forward to the next. 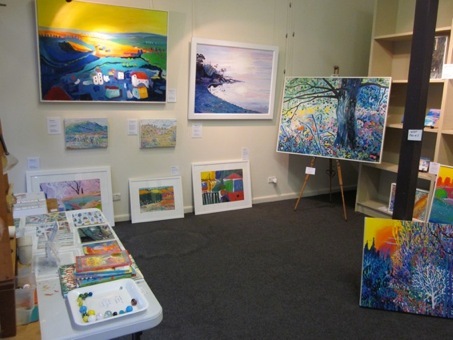 I've put some ideas on the Hints and tips page that could be useful if you have ever thought of using an unoccupied shop or other space to set up a temporary pop-up gallery. They are based on my Little Firefly Pop-up Gallery experiences. I'd highly recommend the adventure - it is wonderful to have your work on display where people can view it directly, and it is wonderful to be on site and to be able to chat with folk. Have I told you about Kerry’s Modern Shorter-Stouter Mobile Marble Sorter-Outer? 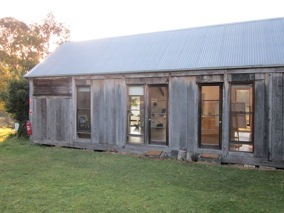 Originally built many years ago to take part in an exhibition at Books Illustrated in Melbourne, it was running hot at my recent Little Firefly pop-up gallery. The idea was for illustrators (I illustrate and write as “Kerry Millard”) to send something that represented who you are, how you tick, but it absolutely couldn’t be an illustration. It could be a video of you tap-dancing, a tea cosy you’d knitted, a recording of you singing a song … So I thought, hmmm, what would represent “me” and what goes on inside my brain? I know! A marble sorter-outer! You may notice such components as - my offspring’s toothbrush, the legs from the TV (from the days when TVs had legs - or did before they got used for marble sorter-outers), the handle grip from a bicycle, … and it works. Saves hours. Just insert marbles where indicated one at a time and, hey presto, sorted!! … But how? Weight? Colour? Well, maybe you’ll come to my next pop-up gallery to figure it out for yourself! 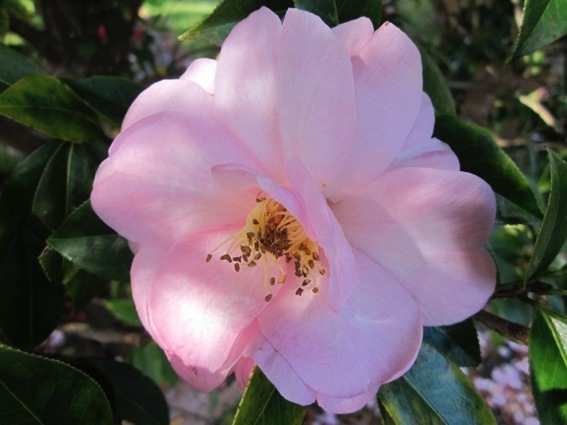 Australian authors are tagging each other to write about the big project on their minds at the moment - and I’ve been tagged by the lovely Wendy Orr. I couldn’t find anybody who was ready to be tagged this week, so instead I’d like to send you off to visit the website of Ursula Dubosarsky. I also adore the work of Jeannie Baker. I’m turning my very first book that I ever wrote, Gordon’s Biscuit, into an eBook! The working title is, Gordon’s Biscuit. I was sitting beside the fire trying to think of an idea for a story. 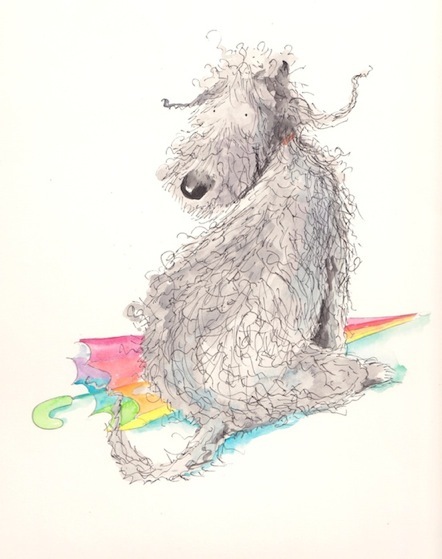 I love dogs and had a funny scruffy little one at the time called Meg who had wisps of fur on the tips of her ears, and whose shaggy coat used to express how she was feeling. I also had small children and I loved their relationship with Meg. 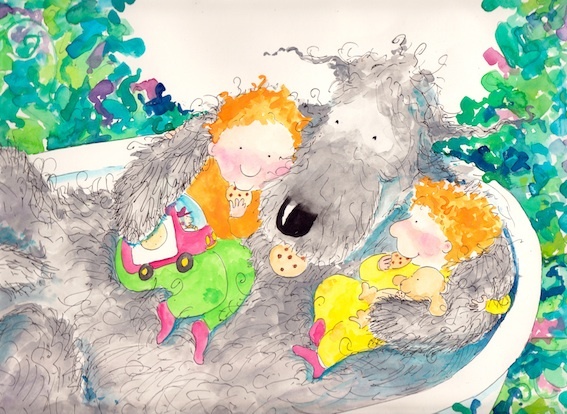 The first idea was that Ellie (who became “Ella”) and Sam, the two main characters, would be trying to do something for their big shaggy dog, Gordon, and the idea of making a biscuit for him came quickly to mind because dogs and kids all like food! I stayed with that idea, even though it evolved a lot. 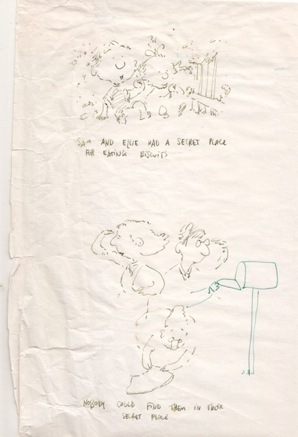 The first draft was a series of drawings scribbled in turquoise ink on one big sheet of paper. The first draft was made in turquoise ink on an A3 piece of paper - here are bits of it - you can see how the ink has gone dark in places. The idea for the eBook came from hearing from people that they loved the book, but it has been out of print for awhile, so I want to bring it to life again myself without going through a publisher, and to learn how to make eBooks so I can start making some more! I suppose the genre is picture book for younger readers. 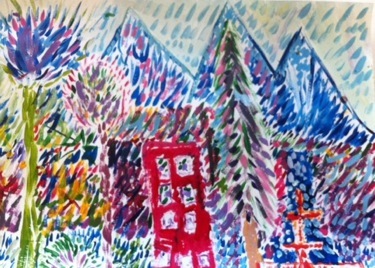 Mind you, I know kids who were still enjoying the original book as they got older and older - I have put lots and lots of little extra bits in the drawings so every time you read it you may discover something else, and little stories that are happening behind the story that I’ve told in the words. I wanted to create a book that little people and big people could read together. Now I want to create a new book which will be available on the new technologies that are in people’s lives, as well as people being able to order one if they prefer a paper copy. I’m excited to do an eBook because it will allow me to add bits and pieces and grow Gordon’s Biscuit into a new kind of book - the original book could only have 32 pages because of the way books are manufactured, but this one can have a few more if I like! And I like!!! Hmmm… I don’t actually have any idea … but I think it would be fun watching people and dogs and a duck and ducklings try out for the parts! 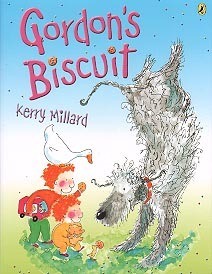 In fact, I was once at a school giving a talk, and one classroom was putting on “Gordon’s Biscuit” as a play! It was great!!!! One shaggy dog who loves biscuits and the park, two kids who love the shaggy dog, lots and lots of biscuits, and a whole neighbourhood who come to the rescue when a new man at the park puts up a sign saying, NO DOGS. In the past I have worked with publishers, but this time I will self-publish for the first time. I’m very excited about this because once I learn how to do it, I’ll be able to write and illustrate lots more stories of my own. The trick is that when you make a book through a publisher, you get a talented editor who helps you turn a lump of clay into a book; I don’t want to end up just publishing lots of lumps of clay! 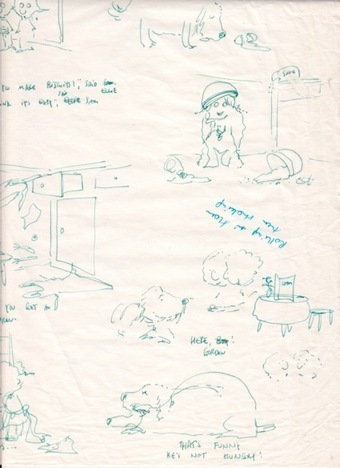 The first draft of the original book, scribbling little drawings in turquoise ink on an A3 sheet of paper, took a few hours to make while I was sitting by the fire one winter Sunday afternoon. Making all of the necessary tweakings and fixings and developing of the story until a final manuscript was ready took two years. 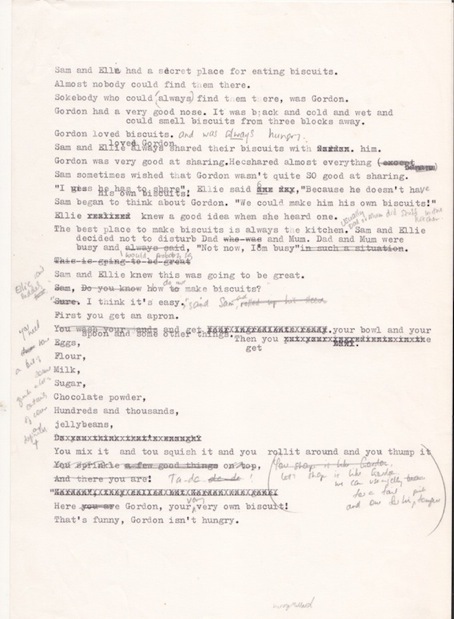 First typed manuscript of Gordon’s Biscuit - this is the whole story - and was typed on a real typewriter, the one that my family gave me so they could actually read my letters to them! There were LOTS of versions after this one and the story changed a great deal. I haven’t yet made the first eManuscript so I don’t know yet how long that will take. Most of the time will be taken in learning how to do this, but I love learning so it should be fun. I have the original scanned images from the original book, but don’t have a computer program that can read them! Oops… Luckily I still have all of the original artwork, some of which has been seen by lots and lots and lots of kids from when I have visited schools to talk about being an author and an illustrator. The images on this page are scans of the original artwork done on my little machine. It’s a bit tricky because the pages are a LOT bigger than the scanner! In the book, the background colour will be crisp white rather than the funny yellowish colour here. I’d like to think that it has a bit of the feel of a Bob Graham book in that he gives us warm relationships - and visual detail and little stories happening beside the one in the words. 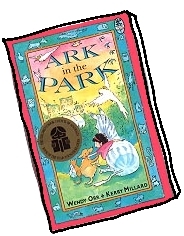 My editor at Angus and Robertson, Cathie Tasker, with whom I had illustrated a few books including Wendy Orr’s Ark in The Park, asked me if I’d like to write my own book. Yes!, I said! So that was the inspiration to create the original book. The inspiration for the eBook and print-on-demand version has come from all of the people over the past few years who have said they remember the book from their or their children’s childhood, that it was their favourite book, that they remember reading it over and over, and want more copies, and want to share it with more children. That is heartwarming. If people haven’t seen the story, I can assure them that they will discover a fantastical park and a biscuit shop like no other! For people who know the book, I am excited that I’ll be able to add a few new pages, including letting readers in on a lot of the other stories and ideas I’ve hidden in the illustrations. It will give everybody even more adventures to share when they read it together. Once I’ve learned what this new technology can do, who know what else might happen?! Goodness gracious, I've been away from the blog for ages! First I was busy with my pop-up Little Firefly Gallery, then I was busy packing it up, and then doing all of the jobs I had put aside, then having a bit of a break reading a stack of books, then getting back into work and keeping cool. The trailer has just been released for a new movie, Return to Nim's Island which will be released in Australia on April 4th 2013. It's a sequel to the feature film, Nim's Island starring Jodie Foster, based on the book by Wendy Orr, which I illustrated (as 'Kerry Millard'). I am in the original movie for 1 1/2 seconds - it was exciting being on the set and watching everybody at work! 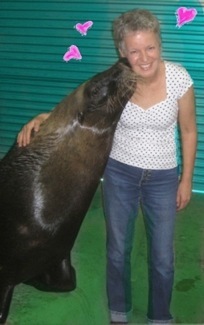 I was hugged by Jodie Foster and kissed by a sea lion. 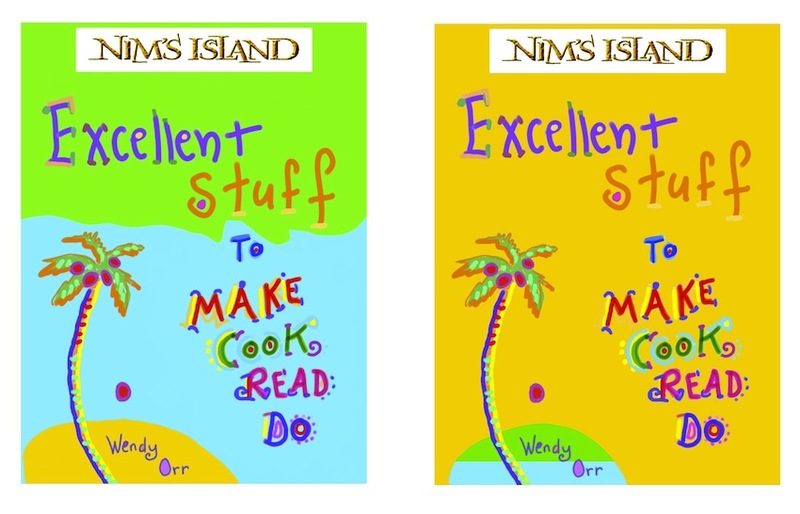 The two original Nim books, Nim's Island and Nim at sea will soon be released in a new single volume, called The Nim Stories. In the meantime, I'm exploring a new project which I'll write about on Wednesday - there's a particular reason why it will be on that particular day, heh heh. I’m growing beans up a bit of lattice fence. 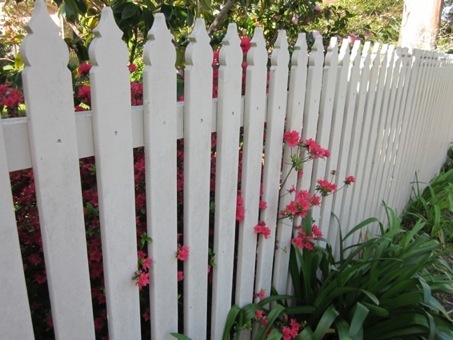 A bowerbird has been sitting on the top of the fence and eating my beans. I don't mind - I just think of it as growing bowerbirds. And there's a frog living in my watering can. 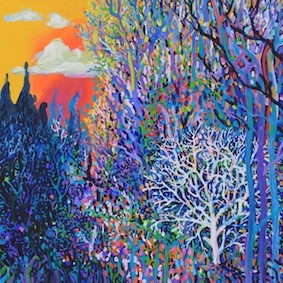 I'll have paintings and prints for sale, a wide range of cards, tiles, fridge art, and a couple of new ideas I'm cooking up for people on a budget who enjoy my work and would like to take just a bit home with them or to share as gifts. There's even a little something for the technological amongst us! I'll be at my easel painting (looking forward to it), and there's a comfy armchair for visitors to enjoy with a coffee and a chat! On Friday Nov 30th from 6 - 8 pm I'd love you to join me if you can, and a group of ceramics artists next door, for a very giddy joint opening ~ everybody is welcome! 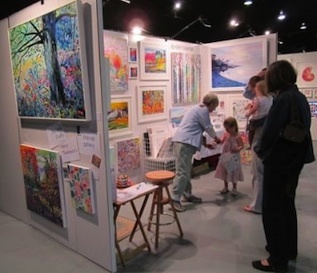 The Sydney Art Expo from Sept 21 - 23 at the Hordern Pavilion, Moore Park, was a lovely chance to meet folk who dropped by, and to send works off to new homes. 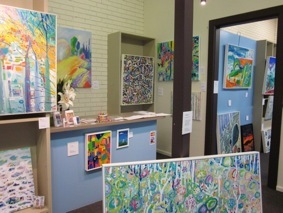 My pop-up gallery, The Little Firefly, popped up there for the three days and I painted on site which is always fun. The team from the “Put Some Colour in Your Life” TV series were there too - lovely people! 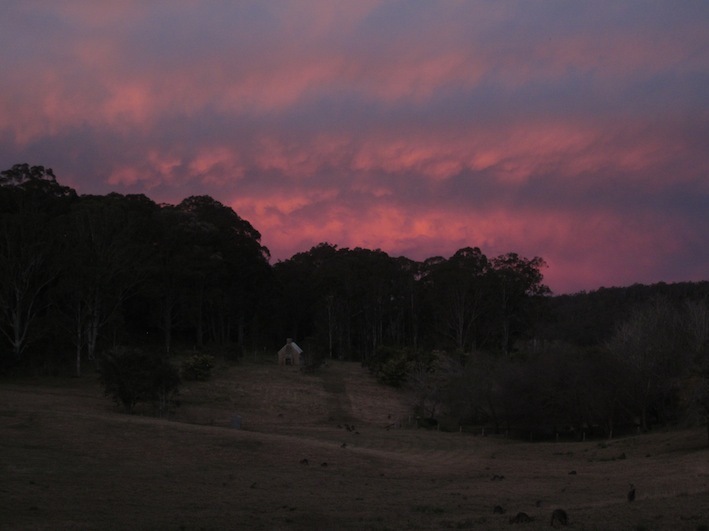 Several months ago I received a very exciting e-mail from the Bundanon Trust inviting me to take up a two week Artist Residency in August 2012 on “Bundanon” near Nowra, NSW, Australia. 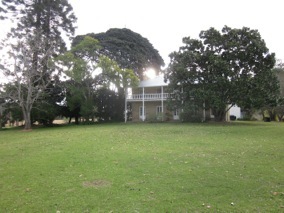 The property is one of three gifted to the Australian people before his death by iconic Australian painter, Arthur Boyd and his painter wife, Yvonne, as an arts education and residency centre. The Boyd family is a family amongst whom making art is life blood. Normal. Fundamental. Assumed. What a wonderful geography in which to steep for two weeks. I was invited as Book Week illustrator/author so had two fun days presenting to and working with primary and secondary school students who were bused in by the Trust from the surrounding district. 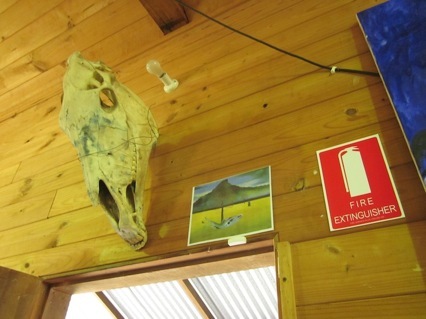 The feeling at “Bundanon” and associated property, “Riversdale”, is one of creativity and invention being nurtured, and inspiration virtually erupts from the wombat-hole-punctuated ground. 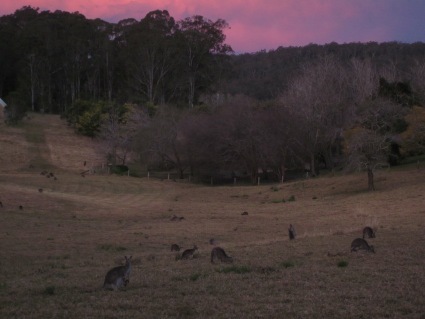 As a Wildlife Reserve, “Bundanon” carries a permanent population of relaxed kangaroos who hang out in the paddocks on the flats, wombats, and a wealth of birdlife amongst the small herd of Brangus cattle and in the surrounding bush and skies. It was exciting to paint along the shores of the Shoalhaven River and under “Pulpit Rock”, both familiar images from Arthur’s work. 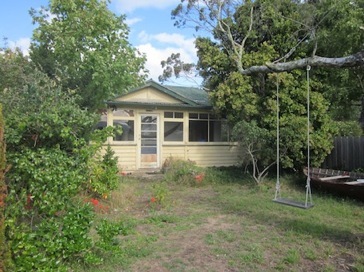 I loved the 1800s homestead, and the walk between Arthur’s studio and the house, his jumper left on his chair in the studio, and painty fingerprints on the light switch. I loved this place. 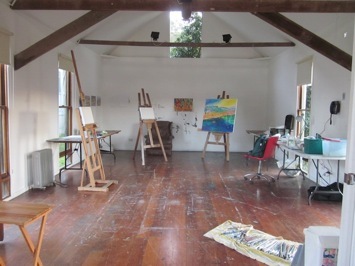 I had a double studio to myself and painted and walked and painted and read and drank cups of tea and painted with eight easels set up…Paintings I made there appear in my catalogue dated August 2012. A richly affecting experience. 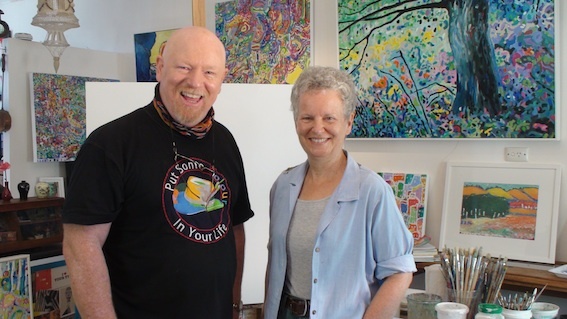 On Sunday July 22nd 2012 at 7 pm on 4METV I'll be featured on the program, Put Some Colour in Your Life, with Graeme Stevenson. It was fun painting and being interviewed - I got excited as always with the colours on the canvas - and Graeme is such a generous interviewer, an accomplished artist in his own right. This series of shows about various artists is his passion, and as of August 1st will begin to air on Virgin Airlines, and is on its way to America. The series has been nominated for a Logie for best light entertainment program. Filming and editing were done by the lovely Sophia - I'm really impressed by how she has put it all together so it keeps moving along… and how inventively she has incorporated one particularly long title! If you miss it on 4METV, you can catch it on YouTube or the Colour in Your Life Website, and I'll put a link on my home page. If you take a peek, I hope you enjoy it! I can now reveal that the movie, "Nim's Island II" has begun production! It is based on "Nim at Sea", sequel to "Nim's Island", both written by Wendy Orr and illustrated by myself under my nom de plume, "Kerry Millard". The books have been published all around the world. "Nim's Island" starred Jodie Foster and Abigail Breslin, with Gerard Butler. I was invited to travel up to where it was being filmed on the Gold Coast, Queensland, to watch its production for three days, and played an extra for a few seconds in a scene with Jodie Foster. It was a great experience, VERY exciting and fun! Nim will be played by Bindi Irwin. 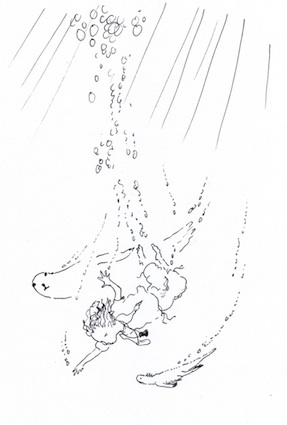 Here's an illustration from the book. 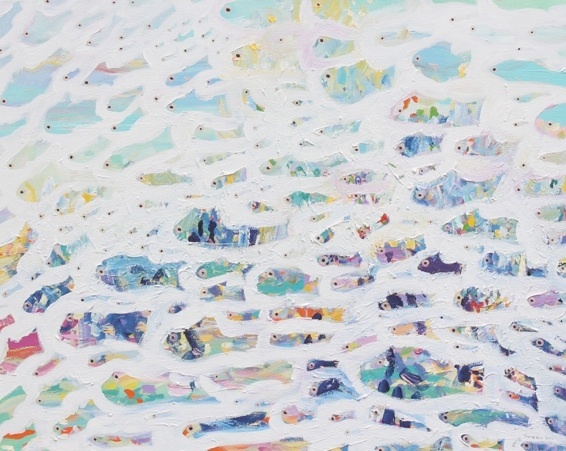 Today from 5 - 7 is the opening of MAN:GAE, an exhibition by the Korean Women’s Art Society in Sydney. It is hanging in Fountain Court at NSW Parliament House and I was invited to be part of this venture to celebrate 50 years of Australian and Korean friendship. 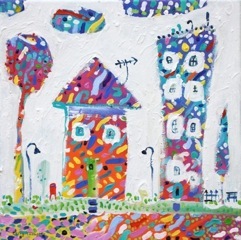 There are about 45 artists, the majority Korean, represented by one piece each,…I have sent “Itty-bitty city” because I thought it best represented friendship and the title of the exhibition which means in full bloom. I’m really looking forward to seeing the diversity of works on display. This is actually a continuation of an exhibition which travelled to Seoul last year. 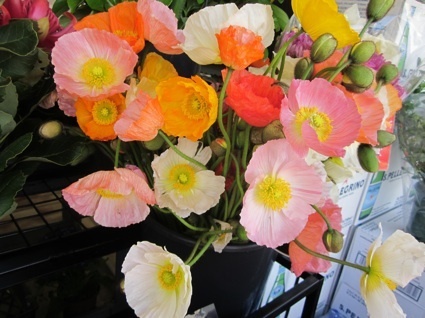 We’ve had big winds and storms - sunny today but clouds scudding across the sky and my windows are rattling - it will be chilly but hopefully not too wet getting to the opening. I’m really thrilled to be hanging in such a wonderful exhibition and location! I bought some really gorgeous and giddy colourful and patterned tights when I travelled through Scone recently - I think today will be a good day for them! Look at what these kids have done! 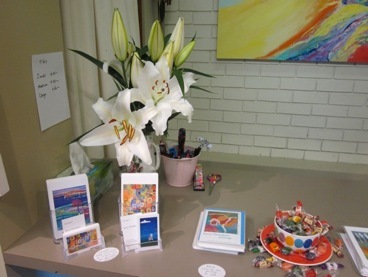 Three of my paintings recently took part in an exhibition at Fairlight, NSW. Vanessa Mistry ( http://www.artsie.com.au/ ) runs art classes with kids in the room where the paintings were being displayed and she told me that she and her students were very excited by the work, and that they had been inspired by it to make some wonderful works of their own. I'm really over the moon that she has sent some photos of what they have done and I'm completely bowled over by it. 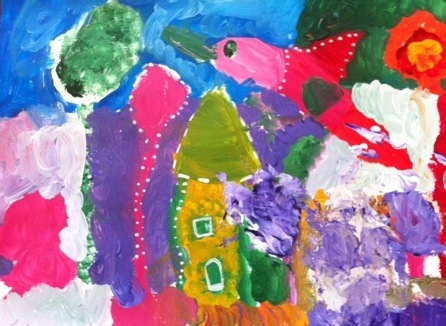 Take a look - I'll show you my three, then four of the paintings done by the kids. Wow!!! I'm tickled pink to have been invited to do a school holiday workshop with Vanessa and kids on July 4th 2012...I can hardly wait! See what I mean???!!! I think they're Fantastic!!!!! How exciting to think that your work inspired somebody, and then to see where they've taken it... I'm absolutely stunned by this! Our Cartoonists on Canvas (and other stuff) exhibition will run for a bit longer - until Monday April 30th. 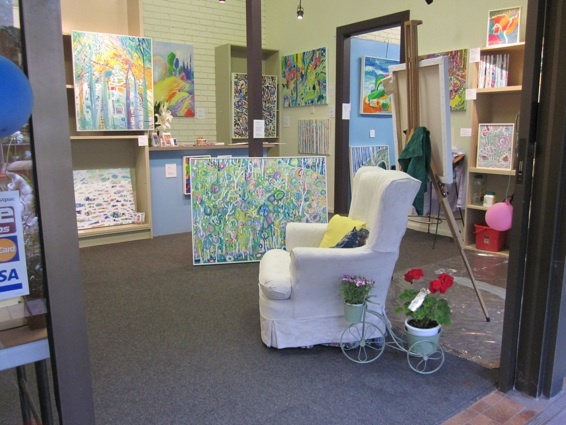 I really love being in the gallery and meeting people who drop in. The opening was fun and the two graphics tablets got good workout by people who tried them out. I know I malign my GPS frequently, and I’m about to do it again. 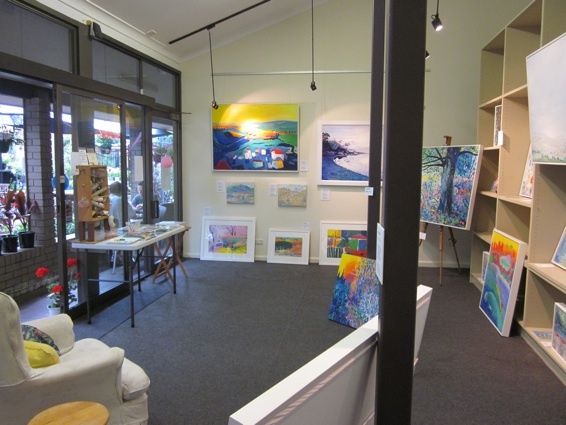 I recently had a wonderful trip to Tamworth to hang my new exhibition, “Are we there yet?” at Weswal Gallery, 192 Brisbane St, Tamworth NSW 2340. 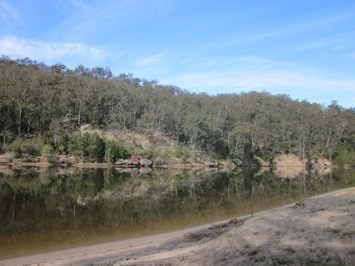 I stayed with lovely friends, then on my way home, popped into Nundle. Gorgeous little town - I bought a dear little white enamel teapot which makes JUST the right amount of tea! 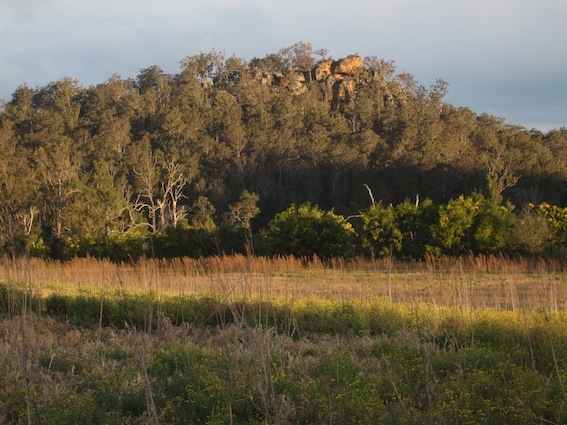 The Tamworth - Nundle road is completely exquisite at the moment after all the rain - hills, and valley floors dotted with horses, pastel grasses and trembling trees - wonderful. Never mind…I had left early and had the whole day and loved the drive. 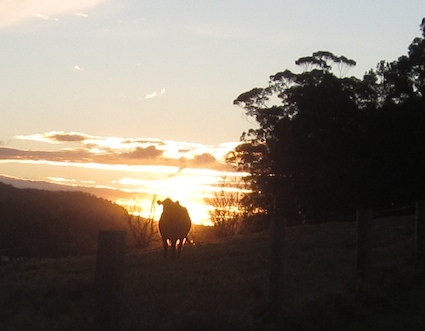 So, back at Nundle, I set my GPS to “HOME”. Now I’m guessing I must have it on the “most direct route” setting, which in the bush (or the country as we would have called it in Canada) can look great on the map, but which in reality meant taking nine hours to do a five hour trip, bumping along single lane dirt tracks, around hairpin bends on the side of hills, through pockets of rainforest, past paddocks and scrub, scraping around trees and bumping over cattle grids through fences with “No Trespassing!” signs on them…past a hidden luxury riding establishments and more than a few surprised looking horses and cattle,… in the end I was getting more than a little worried and decided to take the next chance I could to connect with the main highway. OK, so I didn’t take it because by then I was busting to see where the track would take me next… and eventually I made it home. I was exhausted but what a wonderful trip! 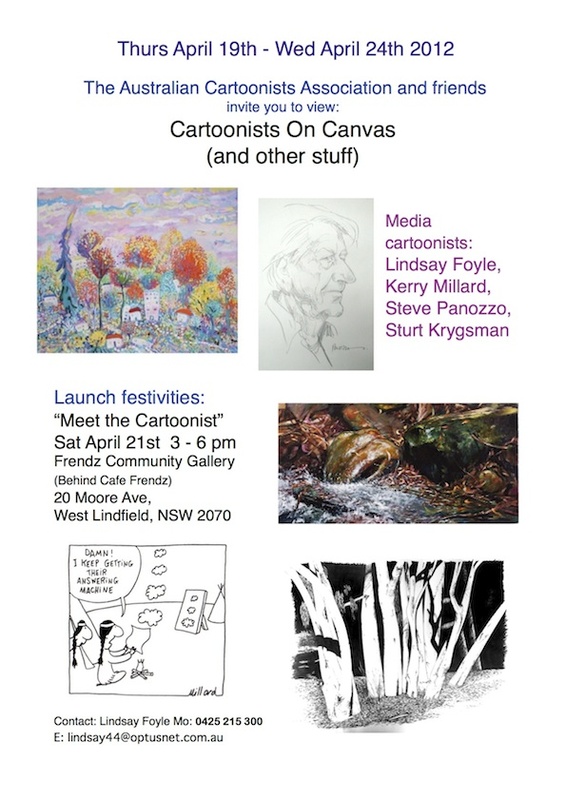 From April 16th to 24th I’ll have some paintings and cartoons hanging in a new exhibition called, Cartoonsts on Canvas (and other stuff) to show our several sides - at the Frendz Community Gallery (20 Moore Ave.,West Lindfield NSW 2070) with Lindsay Foyle, Steve Panozzo, and Sturt Krygsman. Our opening will be on Saturday April 21st from 3 - 6 pm for “Meet the cartoonist!” - there will be nibbles and wine and paper and pens and a graphics tablet and a few cartoonists to chat with … should be fun! 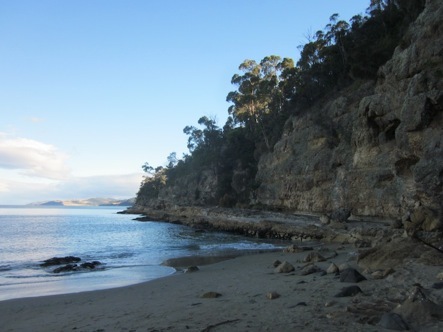 I visited MONA (controversial private Museum of Old and New Art in Hobart) and walked on beaches and rainforest all within a stone's throw of my offspring's dear little elderly (rented) shack at Kingston Beach. The three black hens who live there are beautiful! 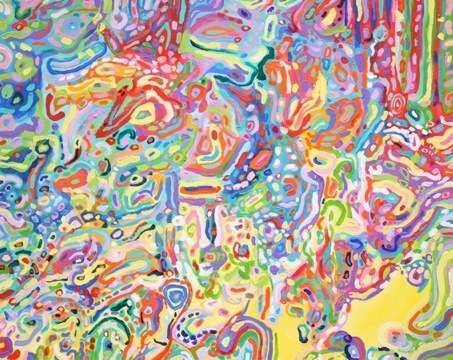 …and a fun Official Opening on Friday March 23rd from 5:30 - 8:00 pm at Weswal Gallery. 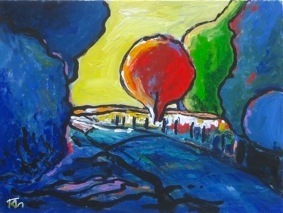 The exhibition runs from March 23 to April 19th 2012 and was booked two years ago! It's interesting to see how the work has evolved since then! But my very new, big and happy news is...you know how you always hope there will be something exciting in the letterbox or your emails, you don’t know what it is that you’re waiting for, but you hope it will be there...well, I received one of those emails. 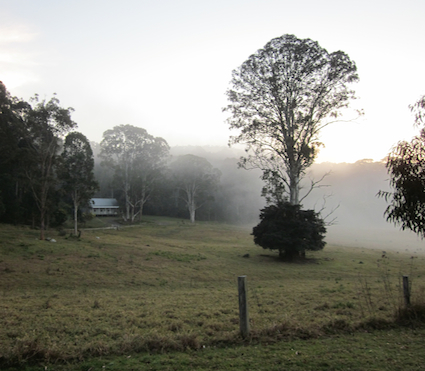 Of course, I didn't realise it was one of those emails until I'd read it a few times, but I've been invited to take up a two week Artist in Residence spot at "Bundanon", the art study centre situated on the homestead of the late and great Australian painter, Arthur Boyd. 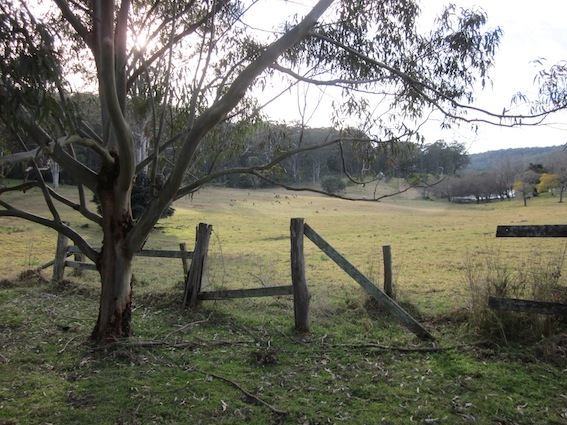 I'll be given a little flat and a STUDIO, and can paint in the paddocks and on the banks of the Shoalhaven River amongst the wildlife and other artists in various fields (as opposed to paddocks)(although they may be in them as well). Bliss! In return, I'll give three talks to school kids from the region who will be bussed in, which will be an hoot!!!! I really enjoy such work. This morning I woke to the sound of a lyrebird giving a performance from a tree just outside my window - there was gentle rain which they seem to like, and as mimics, their improvisation is endlessly fascinating and delighting, and just a little bit magic. OK, so hopefully not my last day ever, but it will be my last day in my Little Firefly Gallery at Shop 2, 20 Moore Ave, Lindfield NSW 2070. I have absolutely LOVED being in the little shop and talking to all of the delightful people of all ages who have dropped in. I’d be sad, except I have two exciting newses. 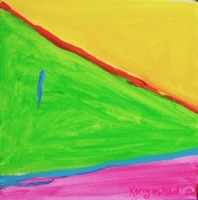 My first exciting news is that three paintings have just gone to wonderful new homes. I am VERY happy. Some day I suppose I’ll be faced with the decision of selling one to a not-so-good home, and it will be a test indeed! 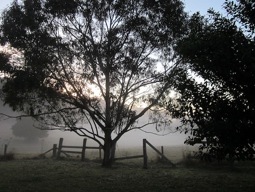 My second but not any less exciting news is that I have just been invited to be Artist in Residence by the Bundanon Trust. 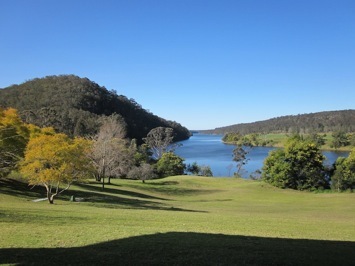 I’ll be tucked away in a little studio on the Shoalhaven River near Nowra on the NSW south coast for two weeks over winter, and will wallow in contact with other artists and local school kids, and the atmosphere of this wonderful, magical property of the late Arthur Boyd. I’ll fill the car with paints and will wear out as many brushes as possible! Yay!!! I’ve really enjoyed the experience and will see if there’s another little shop somewhere which would lend itself to me popping up in it for a bit! 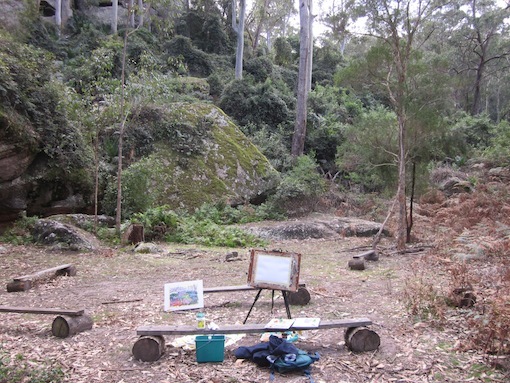 I have a jaunt to Tasmania planned and will try to meet up with another artist or two to go out and paint together. Although I’ll have to start sleeping on my roof if I bring home many more paintings. 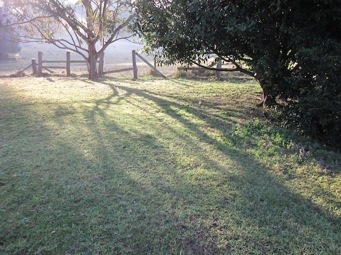 The other morning I was sitting on my back verandah enjoying my cup of tea and toast, and was joined by two rainbow lorikeets, three brown cuckoo doves, and two king parrots. 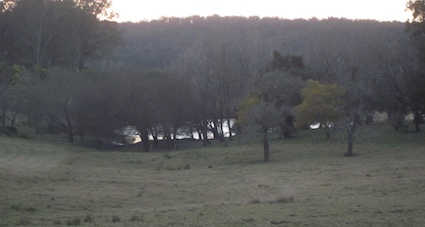 A few evenings ago a male lyrebird was stepping about on the roof of my yurt studio - a VERY rare sight. 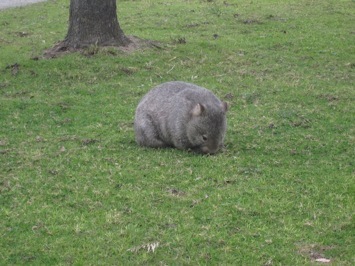 There’s also a wallaby who grazes behind the house. Good grief! What a lucky place to be living in! 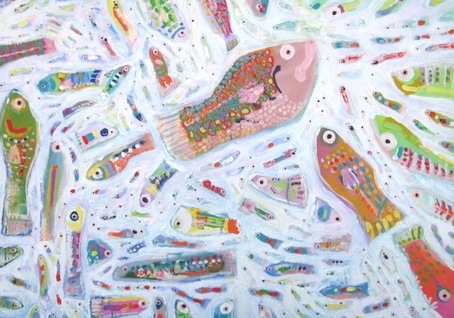 If a fish is asleep, how do you know? Firefly closing, "Watch this space!" opening! 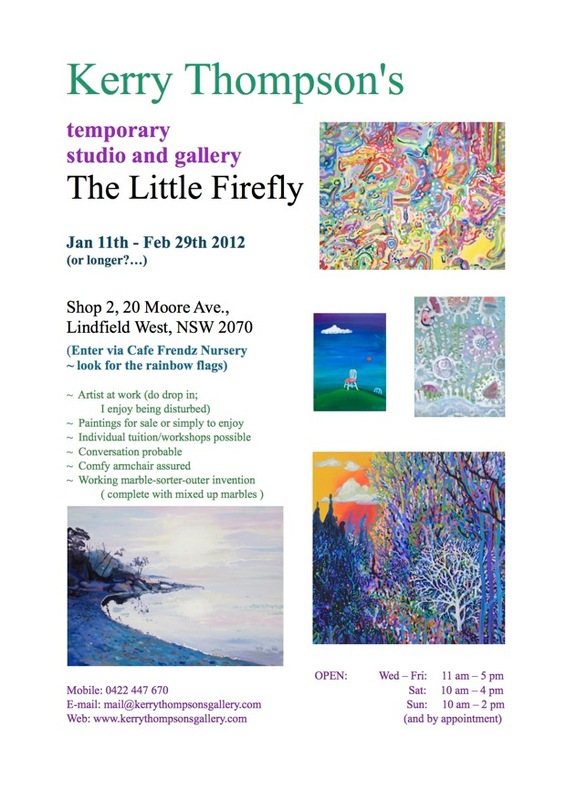 I have loved my temporary pop-up Gallery, The Little Firefly, so much that it will continue to pop up at 20 Moore Ave in West Lindfield (see map and opening hours below) until Sunday Feb 26th, so do drop in to say hi if you get the chance. 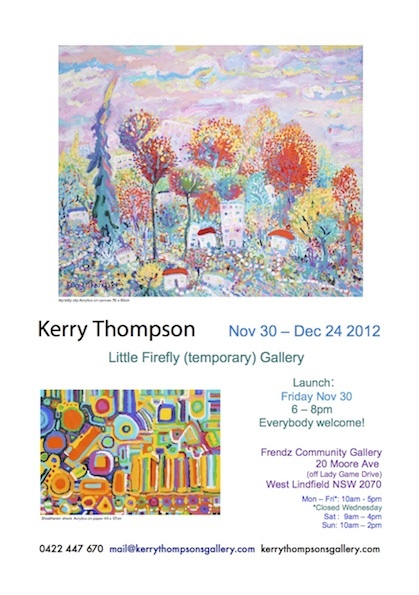 Also, my exciting news is that I am helping to create and launch the Frendz Community Gallery right next door to the Little Firefly Gallery and am taking part in its very first exhibition : "Watch this space!” from Feb 7 - 14 2012. 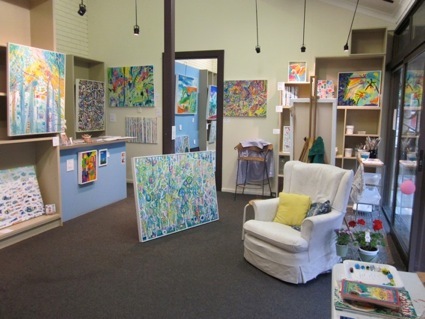 Opening with bubbly (parking easy): Thursday Feb 9th 6:00 - 9:00 pm 20 Moore Ave (enter through the nursery) Lindfield West NSW 2070 Australia (See map below) "Watch this space!” Feb 7 - 14 For this very first exhibition on freshly painted walls of the Frendz Community Gallery I'll be displaying a never before revealed retrospective of work going back...I won't reveal here just how far (other than to say it was the year "Introducing...the Beatles" was released)...including ink, watercolour, and oils, beside a collection of pieces by community member Val Bennett. Come along on Thursday evening Feb 9th for a glass of bubbly and to inspect this beautiful new exhibition space which is opening, and open to many people and many possibilities, in amongst a chirpy cafe and nursery and enthusiastic, welcoming community. You can see my Little Firefly Gallery at the same time. I’ve been loving my pop-up gallery - The Little Firefly - so much that I’ve decided to stay…at least for another month or two while the landlord at Cafe Frendz waits for a permanent tenant. 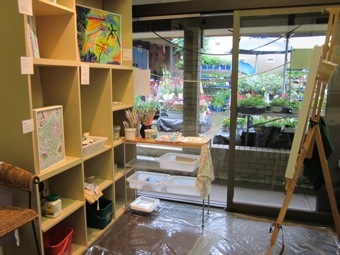 I’ll reopen on Wed Jan 11th at 11 a.m.
I’m in amongst the Cafe Frendz Nursery at 20 Moore Ave, Lindfield NSW 2070. 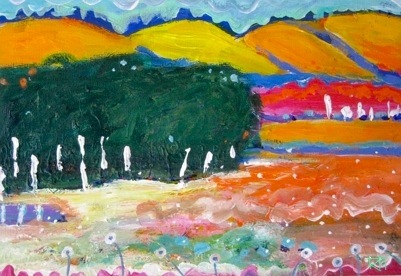 It’s the last day of 2011 - nice to be launching into the new year with such a lovely project. I was going to set up a space in an adjoining shop for people to use for art projects, reading, chatting etc, but the 12 month lease for such a welcomed but financially risky idea was too scary! I’ll offer private tuition in the Little Firefly in my compact studio space as an experiment…not so much to “teach” as to help unlock. - Little green plant-holding tricycle: bought with my first day’s takings. Moral: running shops beside nurseries is probably a bad idea. 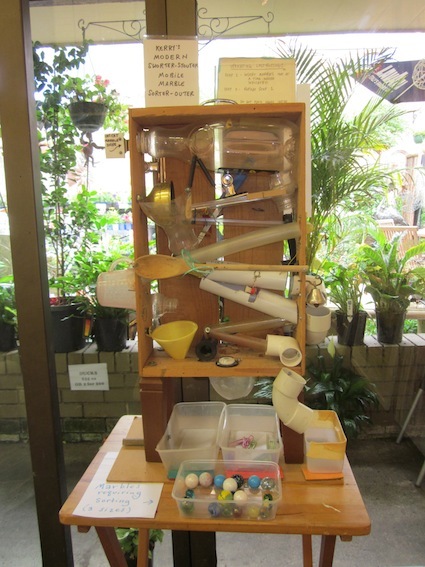 - Home-made marble sorter-outer on table. Even tough, very grown up people end up having a lot of fun with it. Thank you Nancy for your idea that I include it! Incidentally, my apologies to the rather small girl who came in with a wad of pizza dough and of whom I had suspicions when there were fewer marbles after she’d left that when she arrived. I suspected the pizza dough and her grin as she left. Today I found my lost marbles. As I said, my apologies to her for the suspicion: she doesn’t know who she is. -there is a book of my cartoons on a little table near the marble sorter-outer - I have never heard such a variety of snorts, chortles, chuckles, squeaks, and other noises issuing from folk as they look through it - completely heartwarming! If you’re in the neighbourhood, drop in! A comfy chair awaits! The Firefly has been launched! 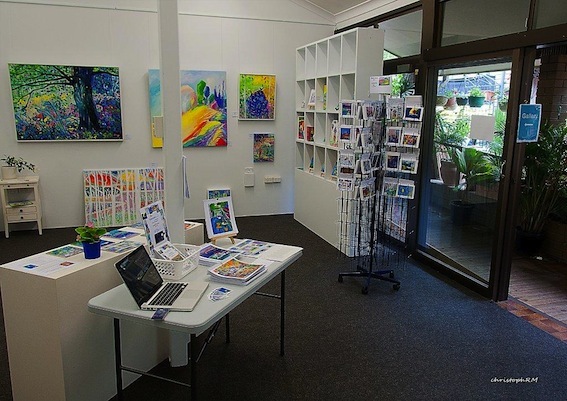 Yesterday was my first day in my 17 day pop-up Little Firefly Gallery (20 Moore Ave West Lindfield NSW 2070 - Dec 2nd - 18th), and I loved it! Mark, from Cafe Frendz, and I had a Garden Party Opening yesterday evening with bubbly and an amazing fruit platter and an equally delectable cheese platter, and lots of lovely visitors. 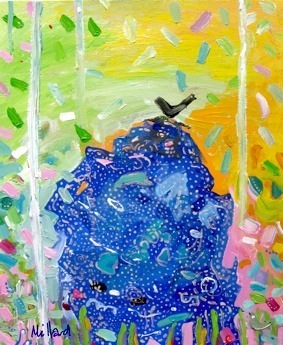 I painted in the gallery during the day, and folk wandered in which meant we had...conversation! Working on my own as I do normally, I don’t get much intelligent conversation, so that was really enjoyable. 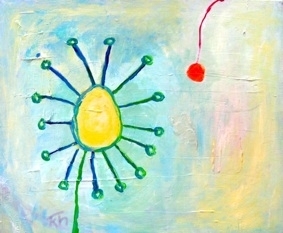 And the conversation included topics besides paintings...so now I know what people do out there in the world. I even had to commute. OK, so maybe 5 minutes isn’t really commuting...but it’s definitely further than from the kitchen to my study. I had lovely visitors and found homes for some tiles I’ve had made from some of my paintings, and for several paintings. Good homes. I love that. 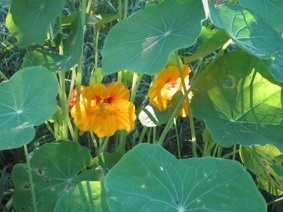 Although one dropper-inner suggested that if they go to a bad home, maybe they’ll help the home become a good one. What a kind and lovely thought. Of course, being situated in a nursery meant that some of my earnings went on the sweetest little green tricycle plant pot holder...I’ll take photos today. It’s amazing what can happen from one day to the next! One day I’m sitting in the delightful Cafe Frendz at West Lindfield, with a friend, having a coffee and minding our own businesses, and the next day I’m suddenly preparing to move into a vacant shop next door as a little gallery from December 2 - 18, where I’ll be minding my own business! 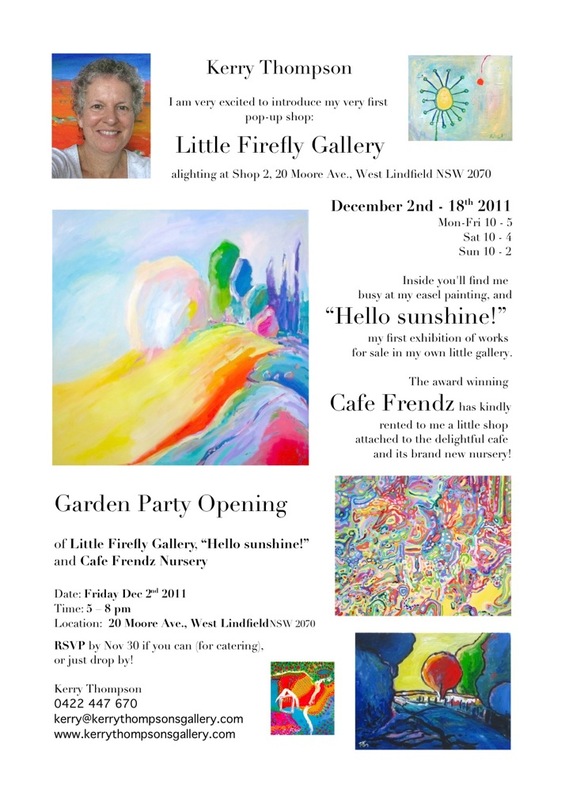 The Little Firefly Gallery will alight at Shop 2, 20 Moore Ave., West Lindfield NSW 2070 behind Cafe Frendz and tucked in amongst the attached nursery. What FUN!!! I’ll include the flyer below with everything you might need to know. 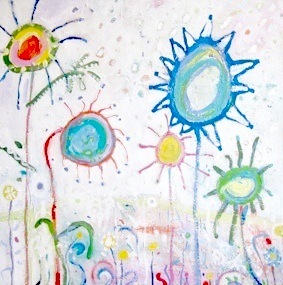 In the gallery I’ll hang an exhibition from my collection of works for sale, called, ”Hello sunshine!”after a painting of that name, and in celebration of the beginning of summer and the launch of the Cafe Frendz Nursery and the Little Firefly Gallery. 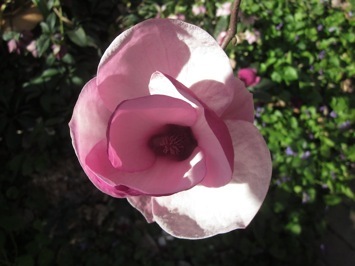 The Garden Party Opening will be from 5 - 8pm on Friday December 2nd, and everyone is welcome. 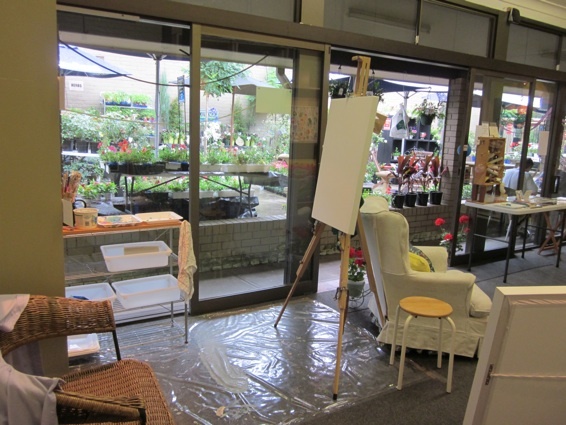 There will be an armchair so you can peruse paintings and petunias particularly pleasantly! Sigh! Life is full of adventures! 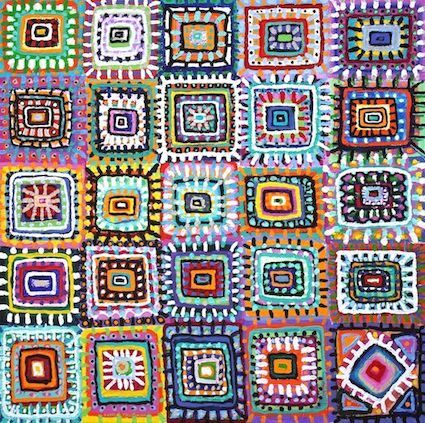 And, I’ve connected with several wonderful quilt shops - I admire their work and they seem to like mine, so more on that later. Further, I'll be introducing information about a new group, Andable (www.Andable.com), who will be launching a website in February 2012 where artists and merchants (particularly who care about their footprint on the planet) will have an online shop, and 10% of sales will go as micro loans to people elsewhere in the world who need a hand getting started with their own enterprising ideas to get over the hurdles imposed by poverty. Then the loans will be paid back after three months. 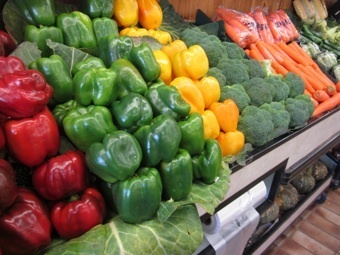 What a painless and brilliant way to put the wealth to work, and help somebody else! P.S. This is so clever and wonderful!! 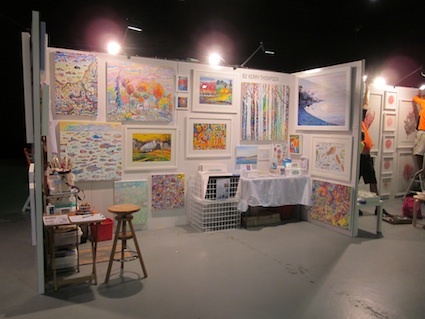 Well I had a lot of fun at the Sydney Art Show at Darling Harbour The mini studio worked well and made me feel as if I was at home, and it was relaxing and fun to paint for the three days and a bit. Lots of lovely people stopped by for a chat. One fellow suggested that I must have a lot of time on my hands. I politely but baffledly agreed, then when he came past again asked him what he meant. 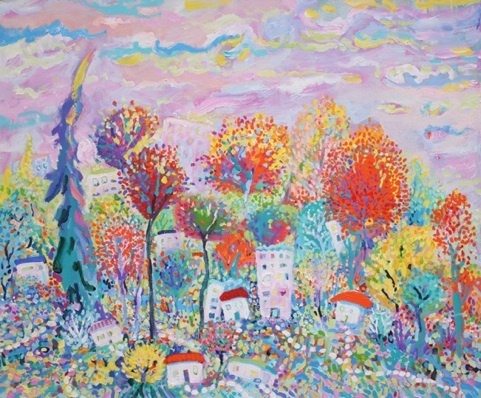 He said that I must have a lot of time on my hands if I have had time to make so many paintings. I said that’s like saying to your plumber that he must have a lot of time on his hands because he has time to plumb, or your doctor must have a lot of time on her hands because she has time to doctor... have I mentioned, as a lapsed vet, how I’m always delighted by the different connotations of “doctoring” vs “vetting”? 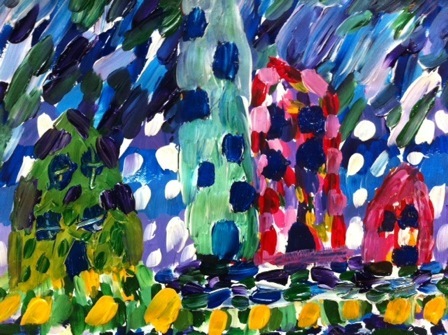 I am delighted to have been invited to hang five paintings in the (Randwick) Sydney Children's Hospital Foundation's upcoming Christmas exhibition. The opening will be held on Thursday Dec 8th from 5:30 pm to 8:30 pm. 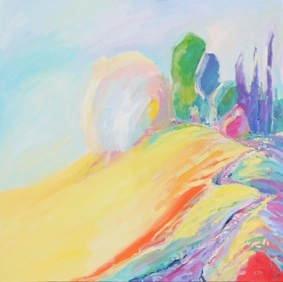 The exhibition will run until January 23rd 2012 and a portion of all sales will flow to the Hospital Foundation to help fund their wonderful programs. There will be works by numerous artists, including a group of us who are Friends of the National Art School, and our particular theme is, "Friends"! 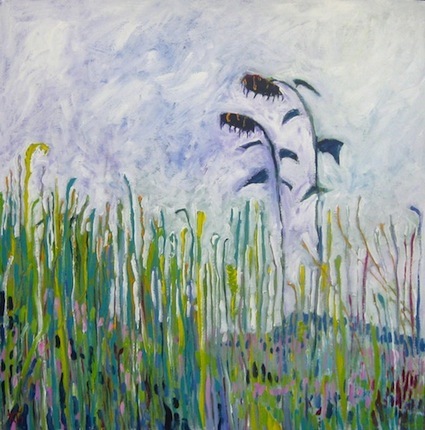 I’ve just made slideshow of some of my paintings to music by Zoe Lewis, Pies for the Public. Luckily, Zoe likes my work, and was happy and generous enough to give me permission to use her music which I love. 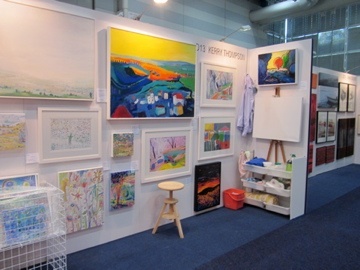 All is excitement and flurry as I prepare for my little Stand D13 at the Sydney Art Show coming up in three weeks! It’s not a big space (1m x 3m) and I’m trying to figure out how to turn it into a mini studio so I can be painting over the three days I’m there. It will be great to chat to lots of people and meet other artists, and hopefully find new homes for some paintings. - when you first try this with the camera on a table behind you, you block the canvas when you’re painting so nobody can see what you’re doing. - if the sound is off, somehow it makes it all less interesting. - you look older than you think. - you probably are older than you think. A few thoughts I’ve been mulling over, particularly having just had a conversation with someone who said he only believes what has been scientifically proven. To my mind, if you accept that there was a time when something was true but hadn’t yet been scientifically proven, then there must be things now that are true but just haven’t yet been scientifically proven. Which brings me to the subject of blinkers and lenses - I know that I am restricted, or perhaps directed in my vision because I was trained in Western science/medicine and that I may be blind to things which don’t fall into the categories I was given. 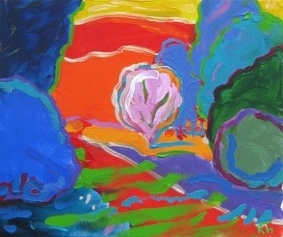 I think it’s important to be aware of the window through which we view the world...which is what our art is all about. Exploring our view and our window. And it occurred to me that we only build instruments to measure whatever it is that we already think exists (I’ll have to think some more about this, and you may come up with exceptions). We probably don’t yet have the right gear to detect/measure many things which exist but are still invisible to our biological (eyes and ears etc) and scientific (radio receivers, cameras etc) and mathematical (physics) instruments. Artist encounter - with cake! On September 15th Gabby Malpas and I are looking forward to an Artist Encounter at Gordon Library to chat about our exhibition there, “I’ll bring cake”, and how we go about making paintings. It should be fun and there will be coffee and tea ... and cake! To join us, just book through the library, who will ask $5 to cover costs. 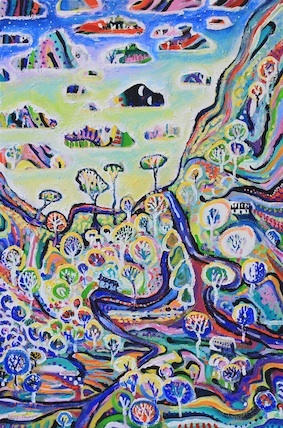 My blog was getting a bit crowded over at www.kerrymillard.com (my nom de plume) so I’ve moved next door here to Kerry Thompson’s Gallery . It also makes sense as most of what I’m doing these days has to do with painting! Like buying a replacement car this week - my trusty old Toyota Corolla hatchback has been doing really well but hasn’t been quite big enough now that I’m moving whole exhibitions of paintings. It ends up getting packed up to the eyebrows and then some. I went to a dealership to try out the car I had decided to buy after a lot of research ( the” Dog and Lemon Guide” is great), and on the test drive with the salesman navigating, I realised we were heading in the direction I’d planned to take afterwards to collect two paintings from a gallery. I asked the salesman if we could make that a part of the test drive and he said OK!!! So we didn’t just simulate but really and truly did EXACTLY what I was buying the car for: we drove to the gallery, I had to weave around city streets and reverse parallel park a couple of times asking directions and finally parking, my salesman friend helped me carry the two paintings to the car where I was able to see what it is like to unlock the beast and load work into it. Fantastic! Then I got to see what it’s like driving with paintings in the back, and unloading them at the end! It was perfect. I did a bit more negotiating and ended up the next day buying the car at an excellent price with roofracks and a roof basket thrown in so I’ll be able to carry everything with ease. Now THAT’s what I call service!!! !